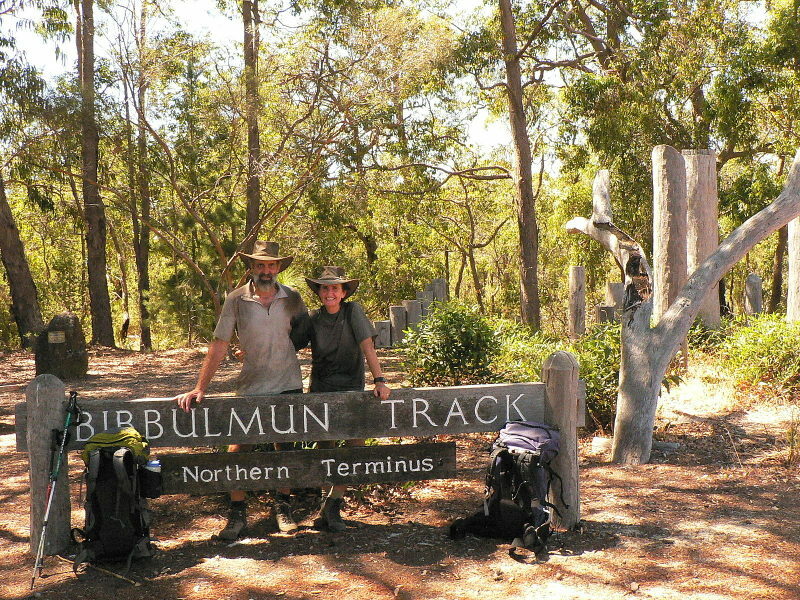 The Bibbulmun Track is one of the world’s great long distance walk trails, stretching 1000km from Kalamunda, a suburb in the hills on the outskirts of Perth, to the historic town of Albany on the south coast. 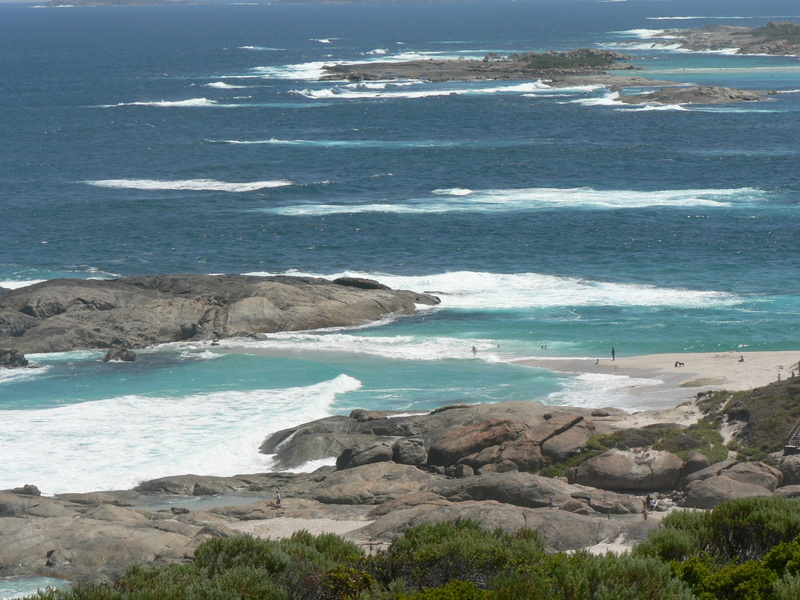 It passes through the heart of the scenic south west of Western Australia. This was also our test walk to see if we might be able to manage the 3500km Appalachian Trail, mentally as well as physically. We chose to walk it from south to north in late summer as it would be cooler in the south in late January, and may have cooled down somewhat before we reach Perth in March. Normal daily temperatures were still in the 35-45 celcius range. Mon 21st Jan, Day 1, Albany to Hidden Valley, 17km. After a late and long breakfast and visiting the information centre, Mountain Designs and the Post Office, we finally start walking by 11 am under a blue sky with blustery winds. 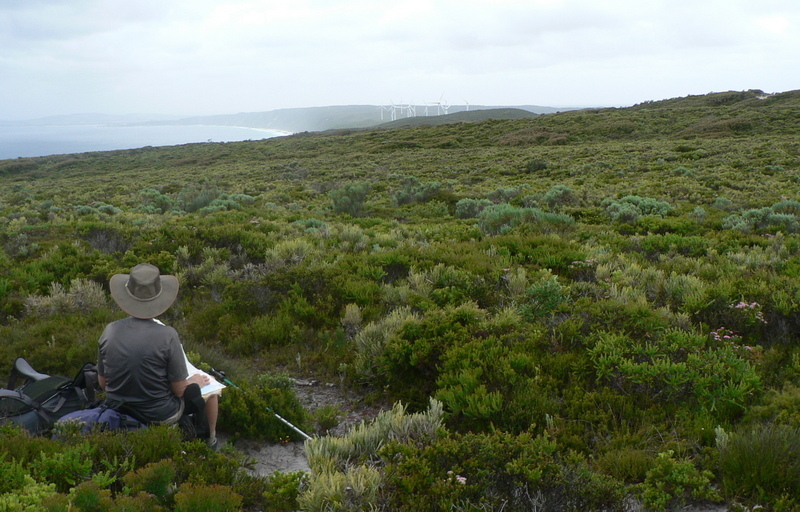 The track heads off around the bay, with great views back to Albany, through heathland with the odd patch of forest. In our typical first day confusion, we manage to lose the track for 30 minutes or so by following old footsteps rather than watching the signs. The shelter has another walker, Fred from Switzerland, fortunately for us as the stove we have doesn’t fit the gas bottle we bought in Albany, and he lets us use his stove for dinner (Trail Magic #1). Tue 22nd Jan, Day 2 to Torbay guesthouse, 16.1 km. Fred headed off at 3 am to do a double day, so we have cold soaked oatmeal for breakfast. The logbook in the shelter has some tales of grumbling and noisy americans, honeymooners and end to enders, several quite emotional as for most people this is their last night on the trail. We are able to call Diane, our caretaker, and learn that our dog Kimmy will remain at the vet for another week before her stitches can come out after her knee re-reconstruction. We follow cliff lines for the morning with occasional glimpses of the coast through the heath. We drop down to the beach at the Mutton Bird Islands, a great place to swim but we move on as the tide is coming in and we have 5 km to cover on the sand. The distance melts away as there is a lot of seaweed float bubbles along the tideline, for Alison to pop as she walks, crunching her way along the edge of the waves. A house is visible in the distance which turns out to be our guest house for tonight giving us a lovely room with a verandah overlooking the bay. A home cooked dinner as the owner does our washing caps off the day. 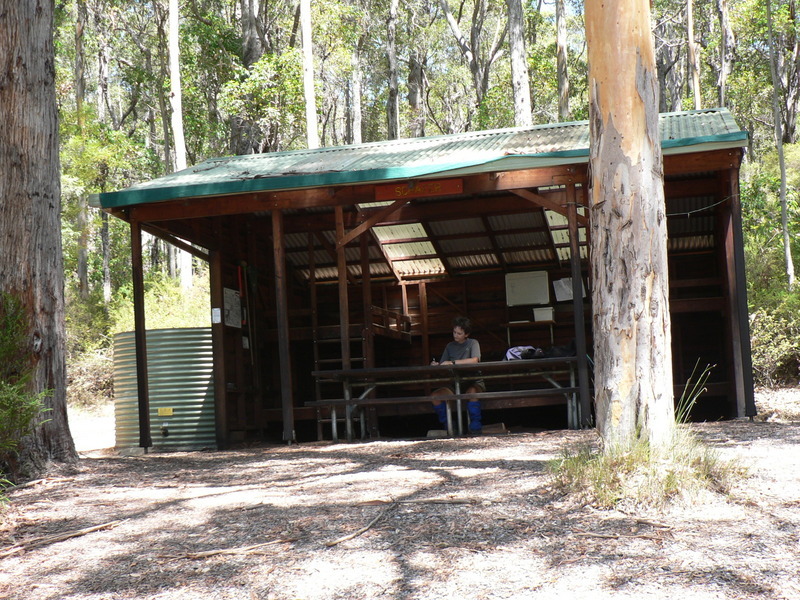 Wed 23rd Jan, day 3 to West Howe Cottages, 24 km. We head off early and have a close encounter with two kangaroos coming at us down the road. The brakes on one fail and he crashes down in front of us before recovering and heading back the way they came. Trail magic #2 means that we are able to arrange for a new stove to replace the incompatible model to be collected by our host for tonight and brought back to our accommodation for us. 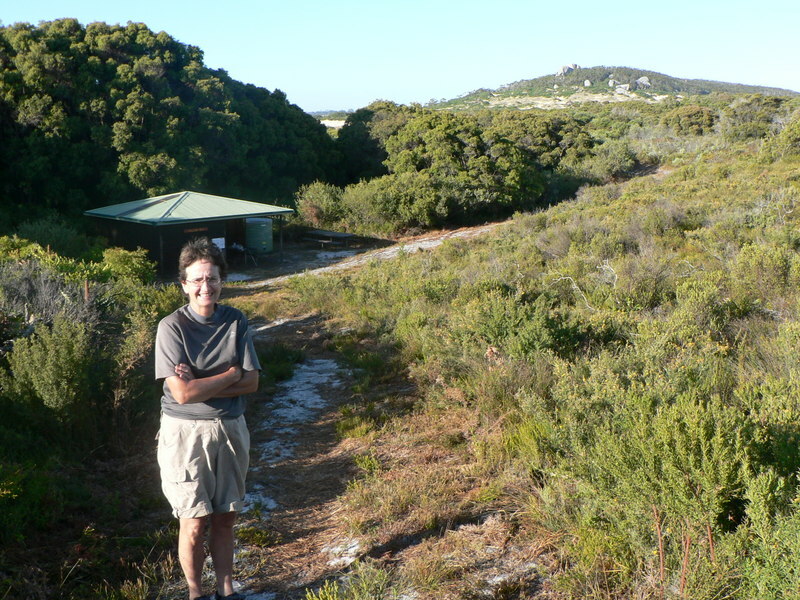 We’re mainly walking through sand dunes and limestone ridges, winding along through the gaps and valleys, so we arrive at the cottages pretty well buggered, especially after the 1.5 km along the sealed road in to the property. Recovery is fast as Gaynor and David along with their two Old English Sheepdogs are lovely hosts and we find much in common with their chosen lifestyle. Gaynor has prepared a spicy lamb curry for us all for dinner, which together with a local chardonnay, made for a very pleasant evening. Home baked bread for breakfast and a packed lunch with ham and cheese rolls, date slice, marsbar, frozen juice and an apple. 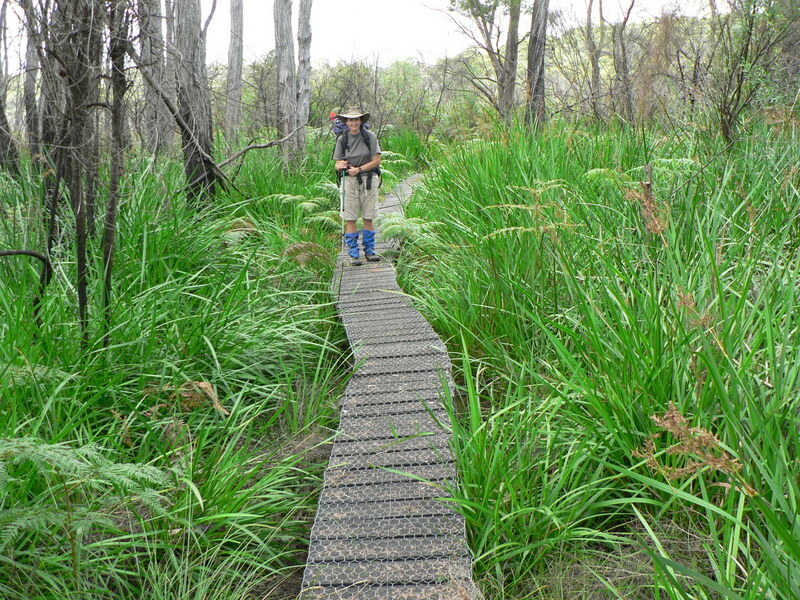 Thur 24th Jan, Day 4 to Wilson Inlet, 25 km. A long day with lots of slogging through soft sand over high ridged dunes. Some of the track had been also damaged by the installation of a high electric fence. 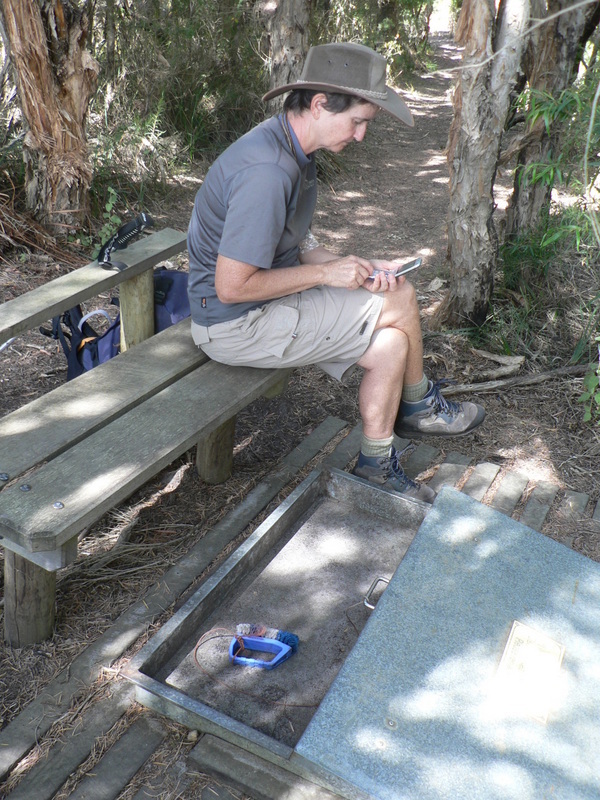 We meet our first boot brushing station intended to slow the spread of dieback fungus (Phytophera cinnamoni). A blueberry farm failed to appear despite signs indicating that we were approaching, or maybe it just hid, or maybe it was just a few km off the track. 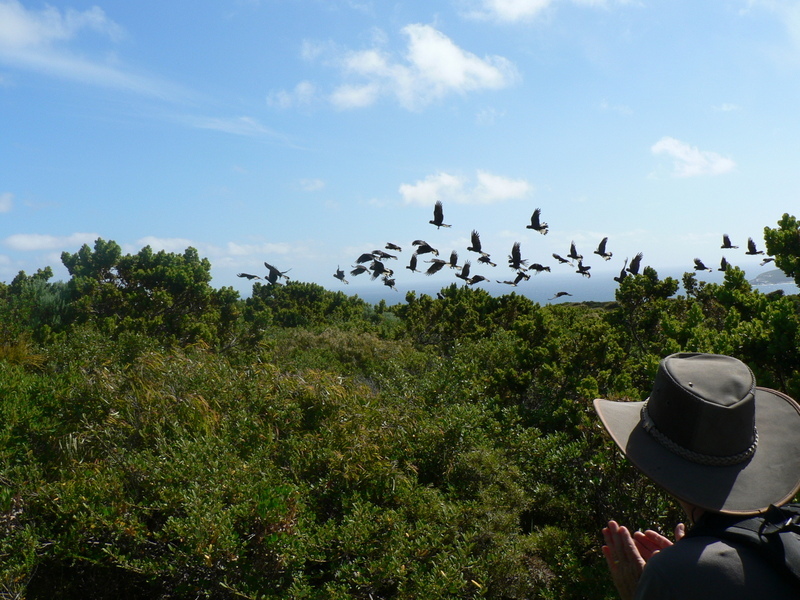 Flocks of Black Cockatoos and a bird hide on the edge of the inlet were highlights. The track followed around the edge of Wilsons Inlet, but we were not allowed to follow all the way to the coast, instead being required to take a water taxi across the inlet to Denmark. The pickup was arranged for 9am Friday so we decided to wild camp nearby, rather than use the shelter at Nullaki and have to walk into the jetty on Friday morning. We find a pretty glade on the edge of the track for a very peaceful night in the “Missing Link”, a lightweight single skin fly supported by our walking poles. Friday 25th, Day 5 to Denmark by boat. 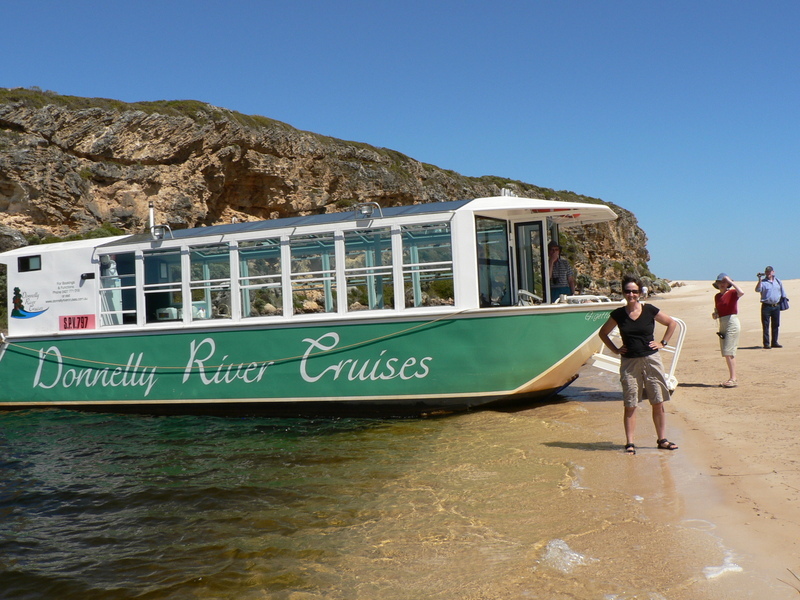 The boat arrived to collect us at 8:45, and took us across the inlet and up the river into the middle of town. The crossing was quite rough with a strong wind raising waves for us to surf along. 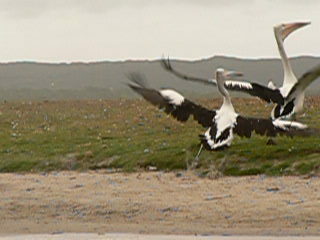 Pelicans begging from the fishermen near the boat ramp. The cutesy Blue Wren hostel for 2 nights, a shower and washed clothes then cruise the town checking out the coffee shops, 3 to choose from. Sat 26th, Day 6 in Denmark. A lazy day shopping for trail food, checking the info centre and wandering the town. 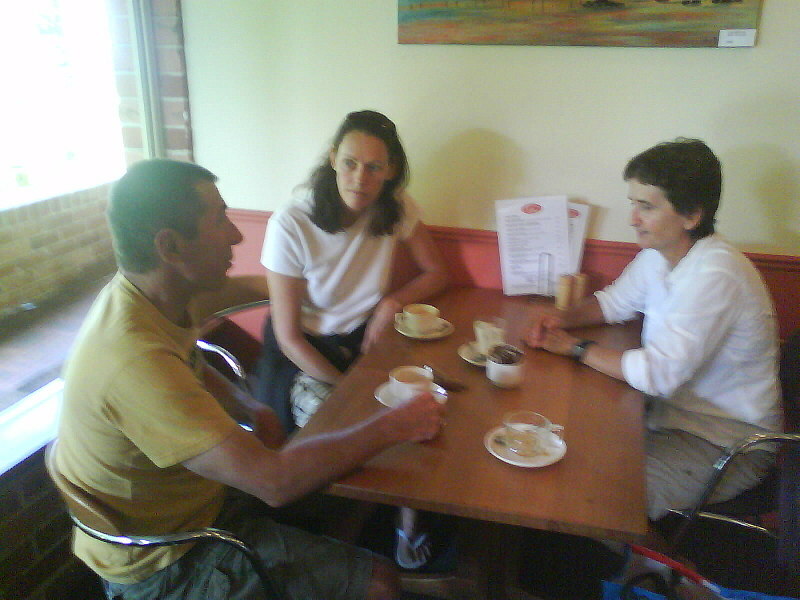 Trail Magic #3 was Doc and Sue (ex Cape Trib people) recognising us on the street and take us for coffee and a catchup. Sun 27th, Day 7 to William Bay, 22 km. 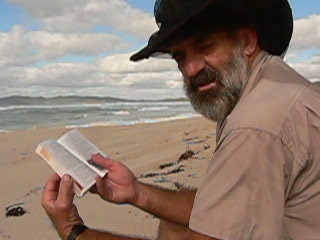 We decide to walk through the suburbs along the edge of the inlet, rather than take the offered ride back to the coast. 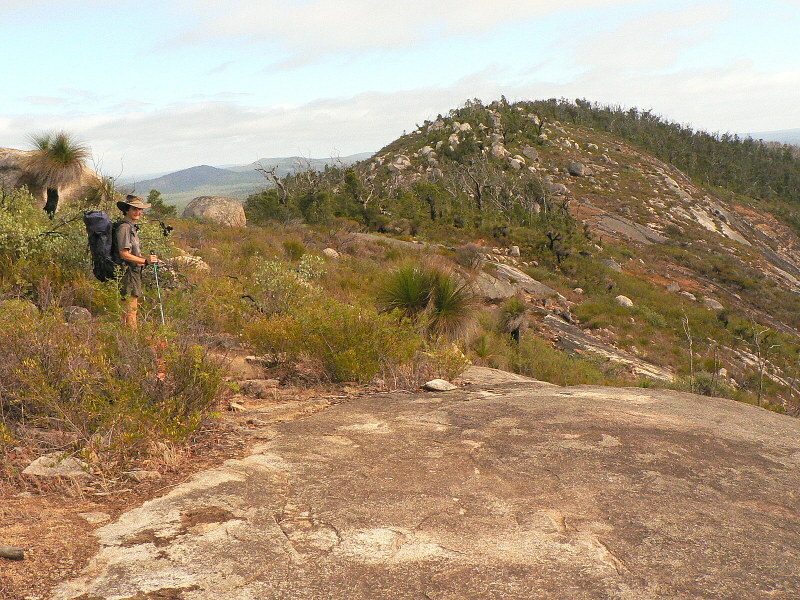 Mt Halliwell gives spectacular views of the granite ridges after a small detour. We drop down to popular Light’s Beach through a farm, and Digby even goes for a swim. The tidal sand isthmus out to a rocky islet makes for an exciting dip, with waves coming from all directions and colliding with one another in explosions of foam and fury. 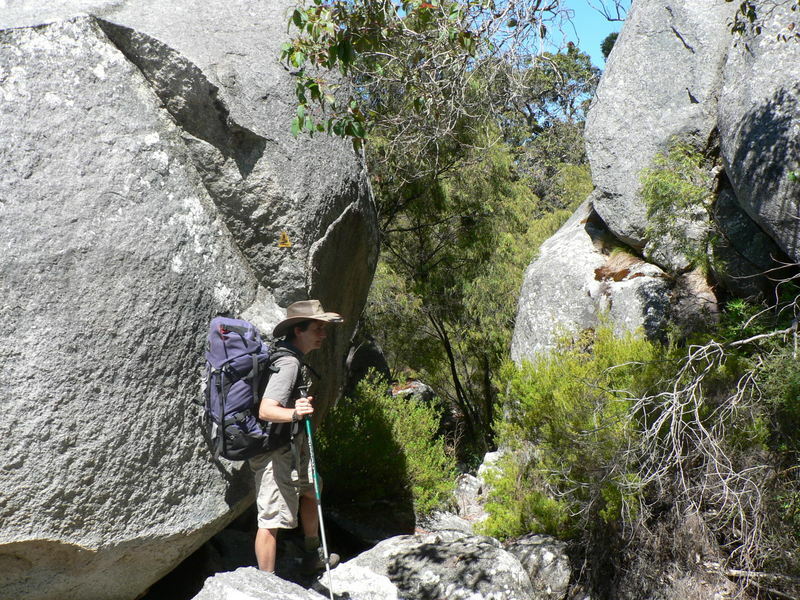 It seems to take forever to reach the shelter, with the track following steep sand ridges past granite outcrops. No other walkers are present on the track for the whole day or in the hut. Hot walking and blisters are starting to appear on our toes. 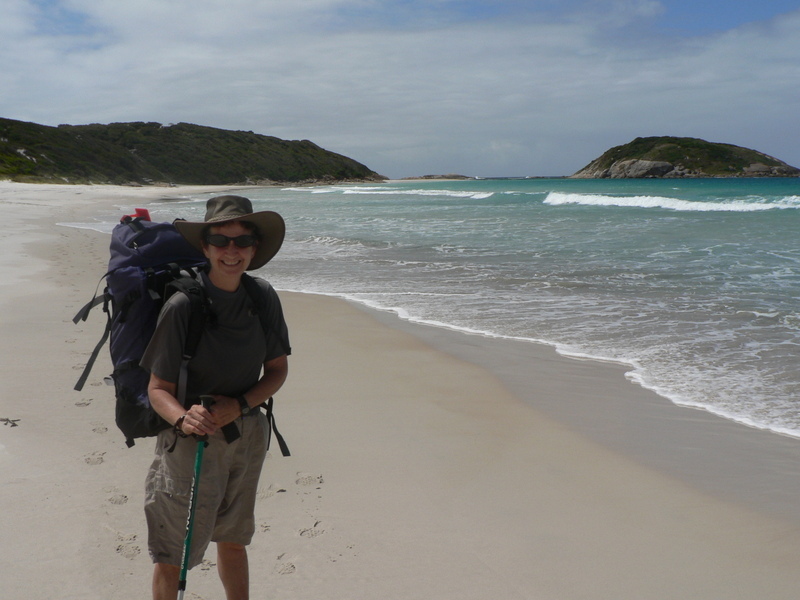 Mon 28th, Day 8 to Boat Harbour, 21.6 km. 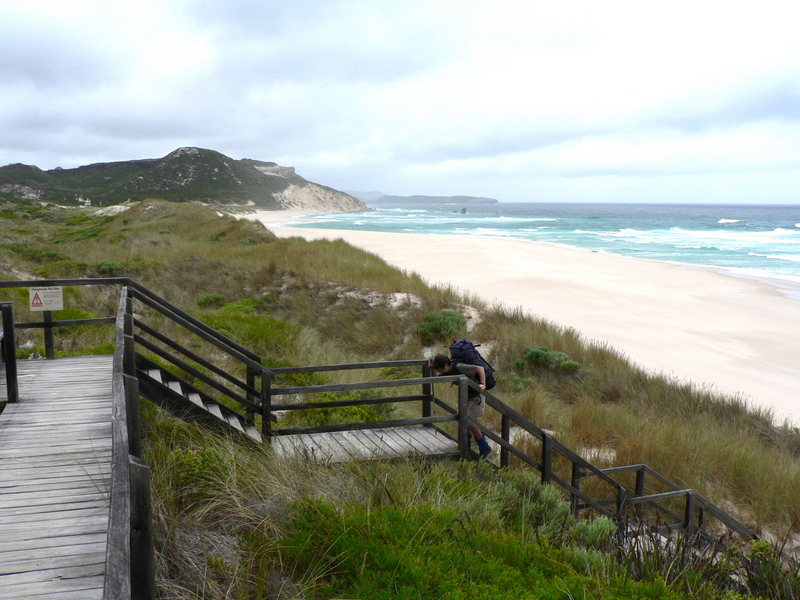 Lots of walking in soft sand today, first along Mazzoletti Beach passing 4wds and fishermen to reach Parry’s Beach caravan park. The bush park is very full, but we run into a couple from Cairns (John and Wendy Rafferty) with whom we have mutual friends at Cape Trib. (Trail Magic #4). They invite us to stay for fruit salad and a cuppa but the trail has many km to go today so we decline and move on. (Wouldn’t do that nowadays). Pass over several dunes on more soft sand before dropping down to Boat Harbour, a sheltered cove empty of people, which is enough to prompt Alison to go for a swim, where she discovers that it is colder out of the water than in it because of the wind. Tue 29th, Day 9 to Peaceful Bay, 19km. 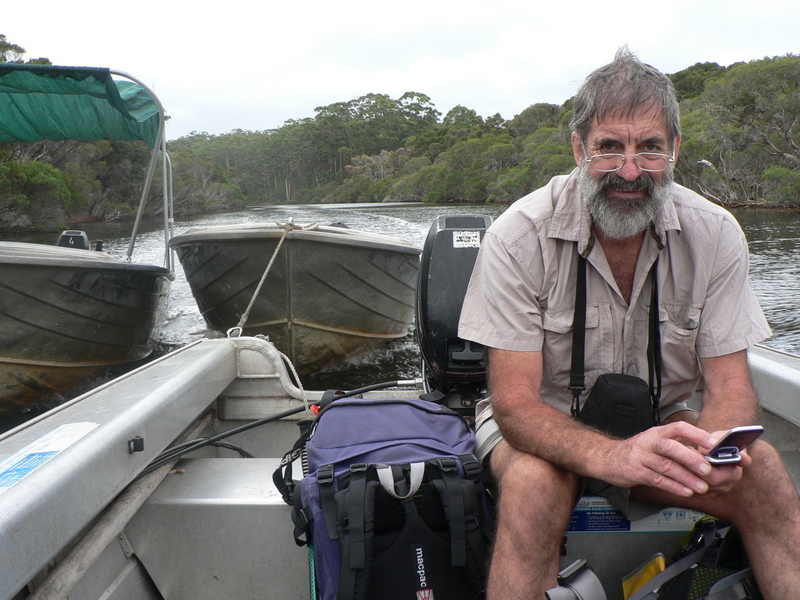 The day started off bleak with wind and showers with rain squalls, but we decide to skip the 5-6 km walk into ‘the showgrounds’ and the canoe crossing of Parry Inlet and instead cross the inlet at low tide by wading its mouth on the recommendation of Graham, the manager of Blue Wren at Denmark. The track stays behind Little Quarrum beach in the soft sand of the dunes, but it looked quite feasible to walk on the beach on the hard sand of low tide. Another 5 km along Big Quarrum beach to the inlet where the tide is just starting to come in. 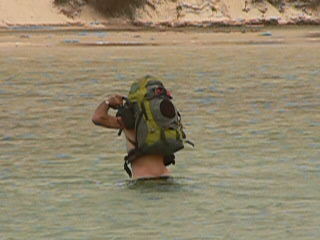 The tidal flow makes the crossing tricky with the sand flowing like water and feet sinking rapidly when you stop moving. We have to carry the packs overhead in waist deep water and keep moving quickly while holding balance but we both emerge safely much to the amusement of some people in 4wd’s who arrive to witness us stripped down for the wade. Another 2 km into Peaceful Bay and an on-site van for the night. The local shop is nearly out of food after a long weekend and their dinner kitchen is closed, so we have to do a creative resupply for the next few days. A potato crisp roll, with Turkish delight, ginger beer and an icecream makes up for missing out on the fish and chips. Peaceful Bay is only 15 minutes drive from Walpole and has about 60 permanent residents blowing out to 2000 over the summer holidays. It is a town of fibro shacks with names like Sootz-us and Kettleson, with unsealed streets and trees still lining the roads. Wed 30th, Day 10 to Rame Head, 12.4 km. Ä bacon and egg roll for breakfast in the van and we are off again. 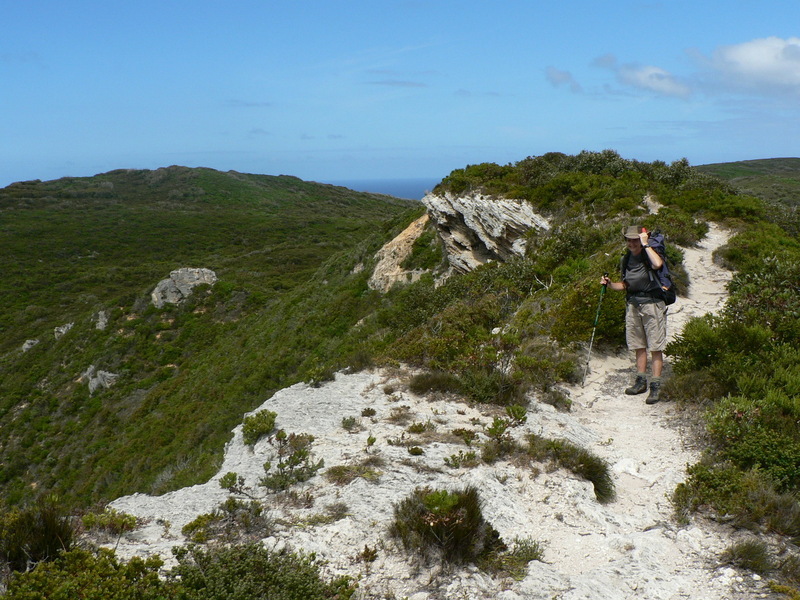 The track follows the coast with some good views in all direction from the dune crests and several headlands before a final steep climb to the shelter. The cold wind is picking up and swirling through the 3 sided shelter, so we decide to pitch the tent inside for some more protection. No-one else turns up and we have the shelter to ourselves again. The Mad Axeman has just been through according to the logbook, aka Jim Freeman had then walked 10 end to ends and many hours as a track volunteer. 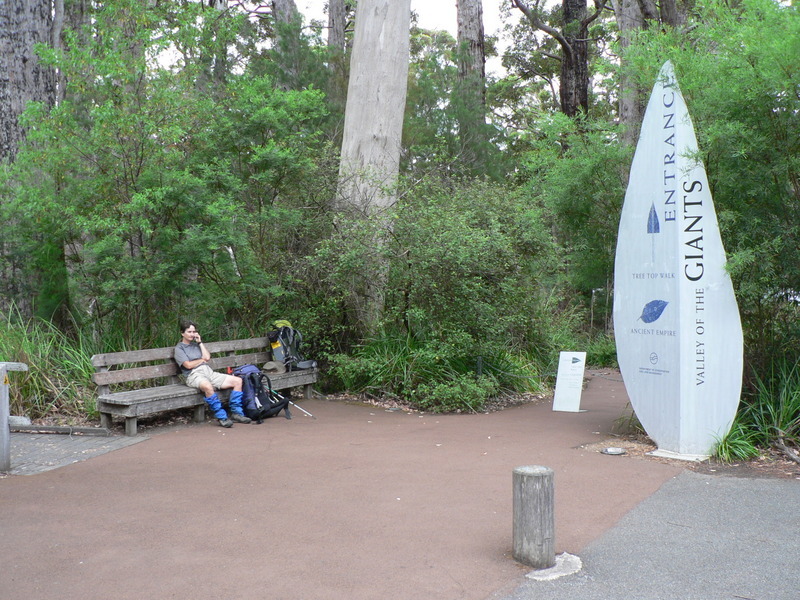 Thur 31st, Day 11 to Giants Camp, 17.8 km. We drop down off the ridge to Conspicuous Beach, a beautiful place without the wheel tracks infecting every other beach along the coast. We take a break on a whale watching platform, but we have to imagine the whales as it is the wrong season. 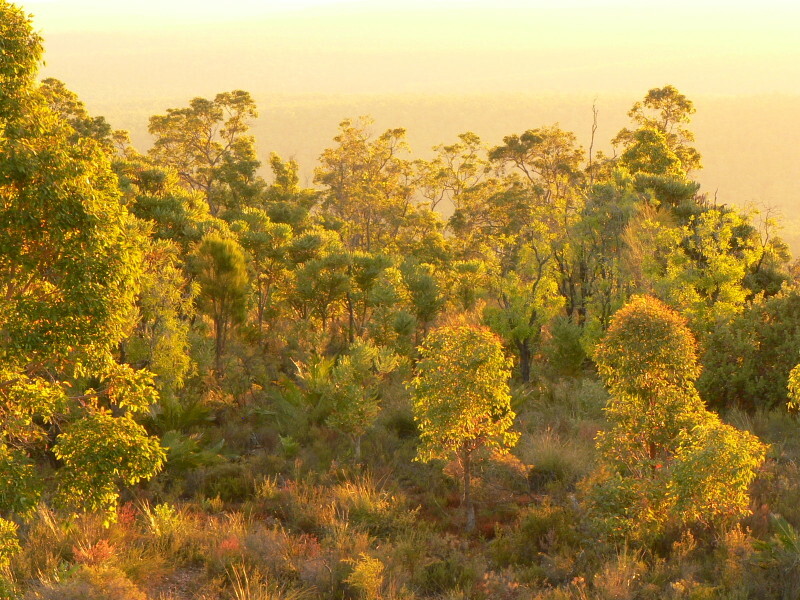 We leave the coast and head inland moving through several changes in habitat types till we reach the jarrah forest. This is so far the best days walk for the scenery and vegetation. Fri 1st Feb, Day 12 to Franklin River, 13 km. 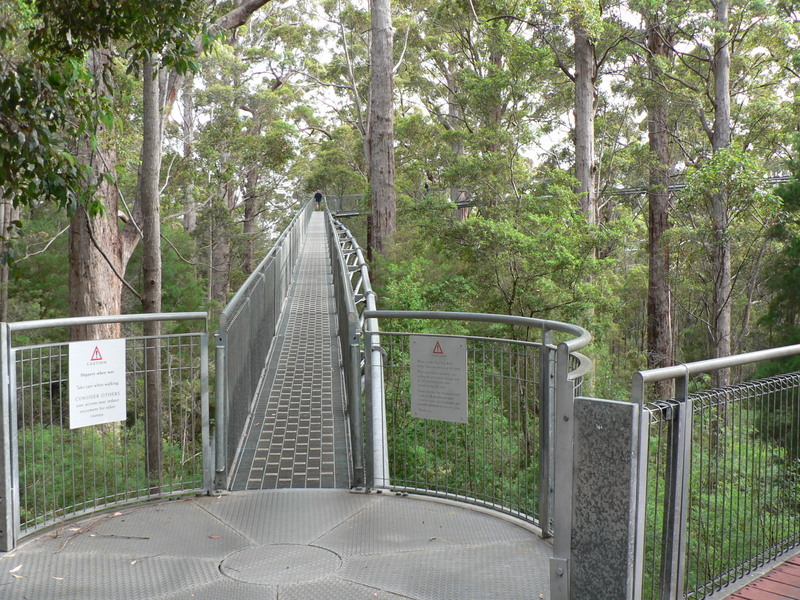 A short day with a stop at the Valley of the Giants and a wander along the aerial walkway. We arrived at 8:30 and had to wait until 9 for it to open. A phone connection, vending machine coffee and an icecream made the wait worth-while before the walk through the canopy. 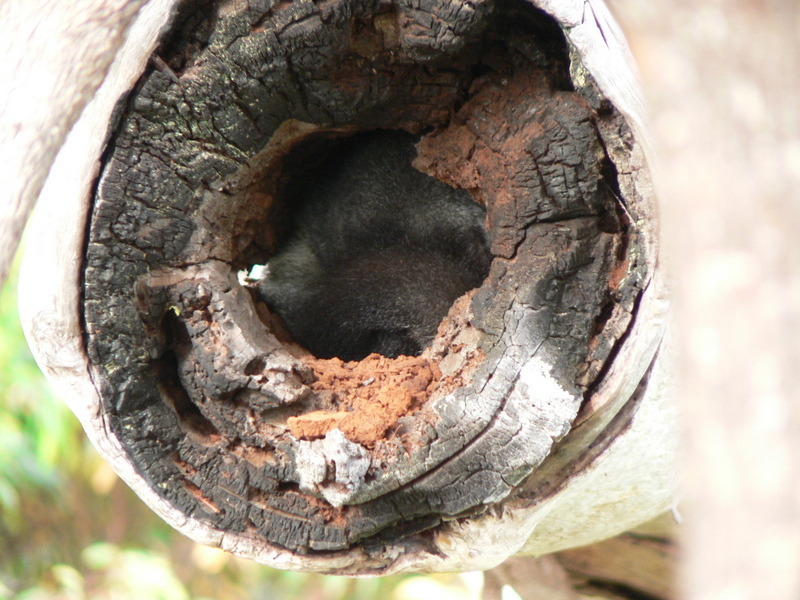 A possum glaring out of its tree hollow when we disturbed its sleep gives us an early warning, for the hut tonight has logbook stories about possums eating through packs. We walk through forest to the shelter which is right on the river, so we get to swim and wash our hair. Feeling human, especially after an easy day. 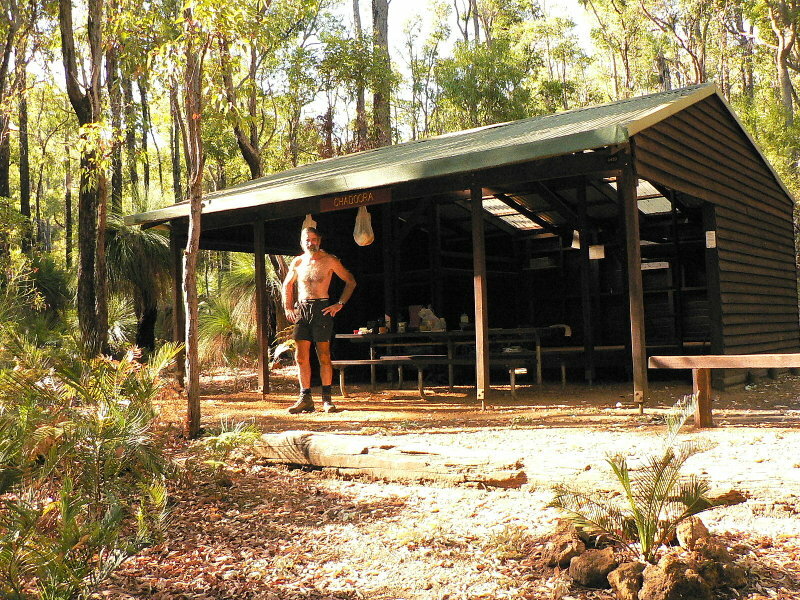 Sat 2nd, Day 13 to Walpole, 17.6 km. 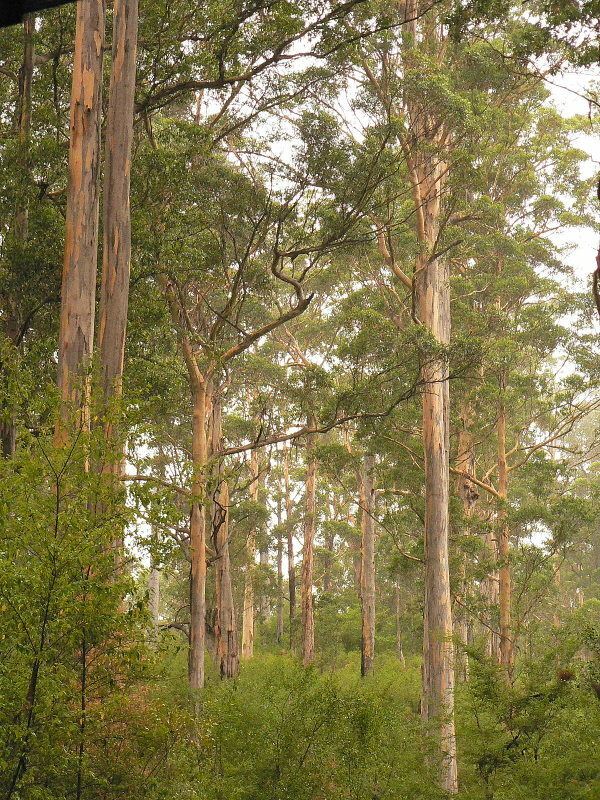 The track winds through Karri and Tingle trees before it drops to the inlet where we follow the coast around to town. It’s cloudy and pleasantly cool for walking. The Walpole Lodge has a great room with ensuite for us for $77, so we are able to do our washing, buy the next week of food and wine with pizza for dinner. Our caretaker tells us that Kimmie is home again and is full of beans. Sun 3rd, Day 14 to Long Point, 22.8 km. 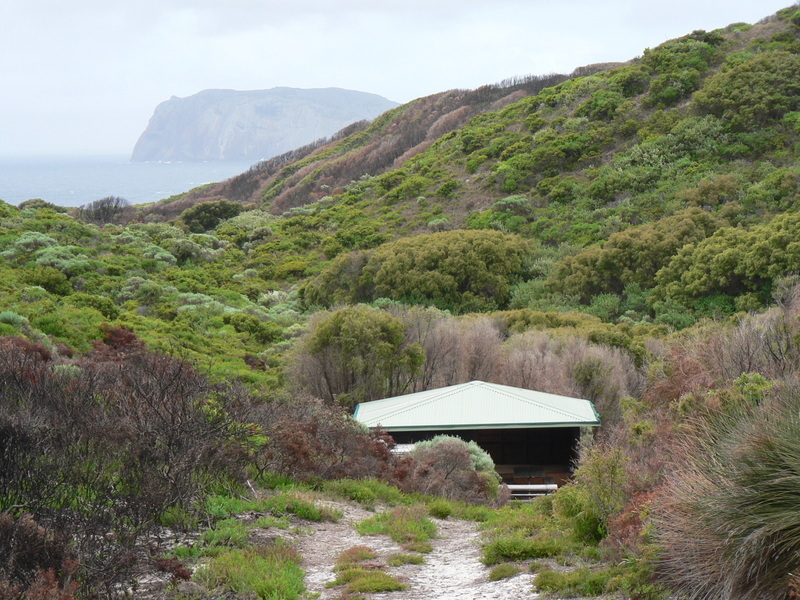 We decide to double hut today as Mt Clare shelter is only 10 km and we’re feeling fit, but we hadn’t realised that the track is back into the sand dunes. The weather is deteriorating with wind and rain, but at least it’s cool without the intense sun we’ve experienced at the start. 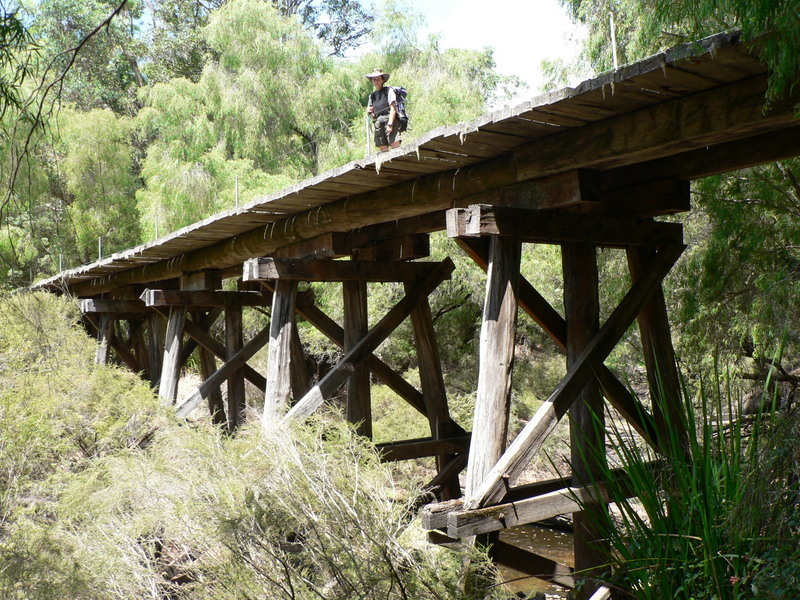 A long “chulange pul” swing bridge across Deep Creek provides a highlight for the day, as do many kangaroos in the late afternoon light as we walk through a burnt area. 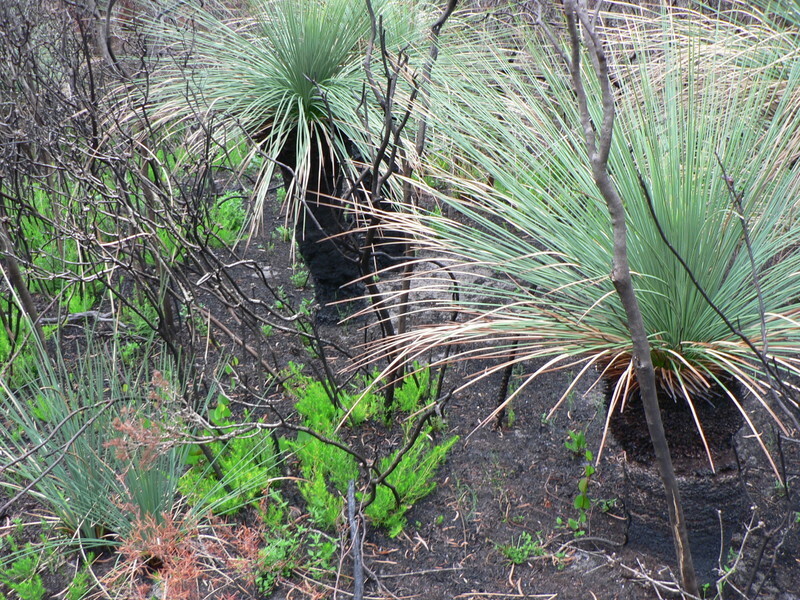 The fire was apparently a control burn 3 months before, so there is much regrowth on the ground and the grass trees are bright spots of green, concentrated in the valleys where they look like they are attending a cocktail party. Mon 4th, Day 15 to Wool Bale, 17.7 km. Squally again overnight with wind building but little rain once we set off. 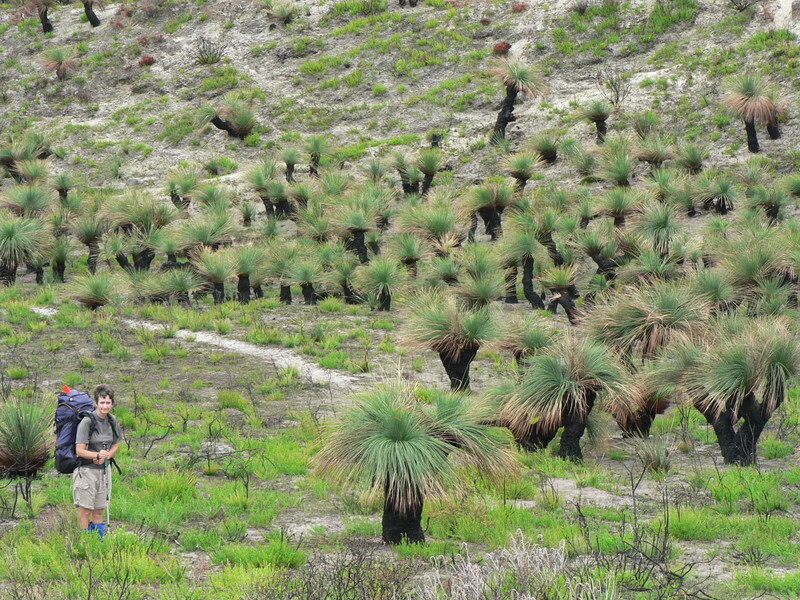 We’re walking through more burnt areas, seeing several emus and lots of tracks on the bare sand. Up and down over dunes until the final blowout allows us to glissade as if on snow down to Mandalay Beach. There is a cat trapper working here for the Dept of Environment who shows us his gear. Wire boxtraps and rubber lined jaw traps helped by audio call miaows and a cat poo smell bait to lure them in. Mandalay Beach is blowing a gale, making for an uncomfortable trudge down the beach to a set of stairs. This beach is where the Mandalay out of South Africa was beached in severe weather in 1911. 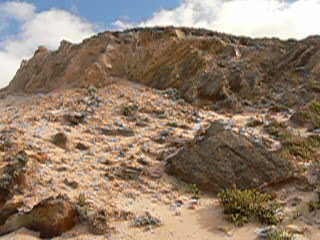 2 crew members walked to Nornalup Inlet where they raised the alarm and the remaining 11 were rescued. The ship is sometimes exposed on the sand, but not for us and we head inland over the dunes and have flat walking for 8 kms through areas described as “seasonally inundated”. Not this time although there are many stories in the hut log about wet feet. Birdlife is prolific along small creeks. 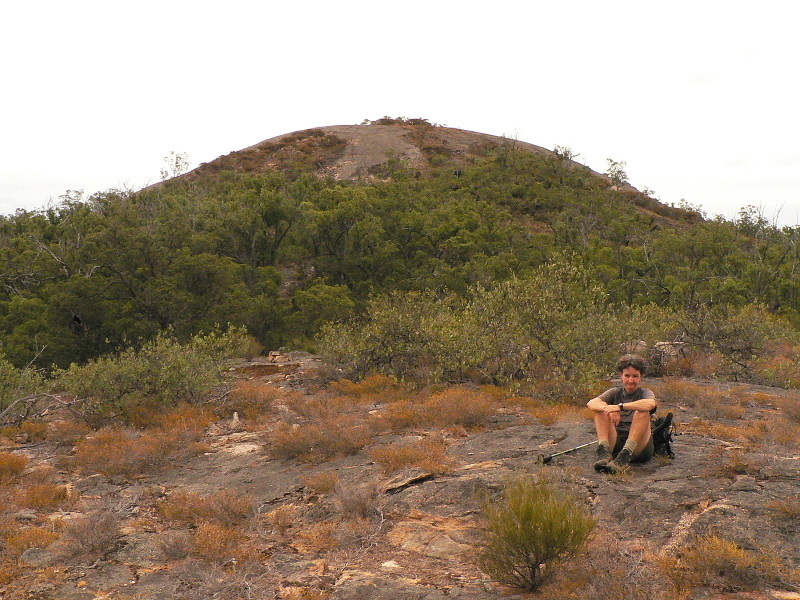 Tue 5th, Day 16 to Mt Chance, 21 km. There is a story in the Wool Bale hut log of two walkers who had arrived there from Mt Chance and headed off in the morning intending to go on to Long Point, but got turned around and went back to Mt Chance instead. Oops. The walking today is hot under an intense sun for the first time since leaving Albany. We are able to make a good pace for the morning but are flagging badly by the end of the day with the soles of our feet burning. 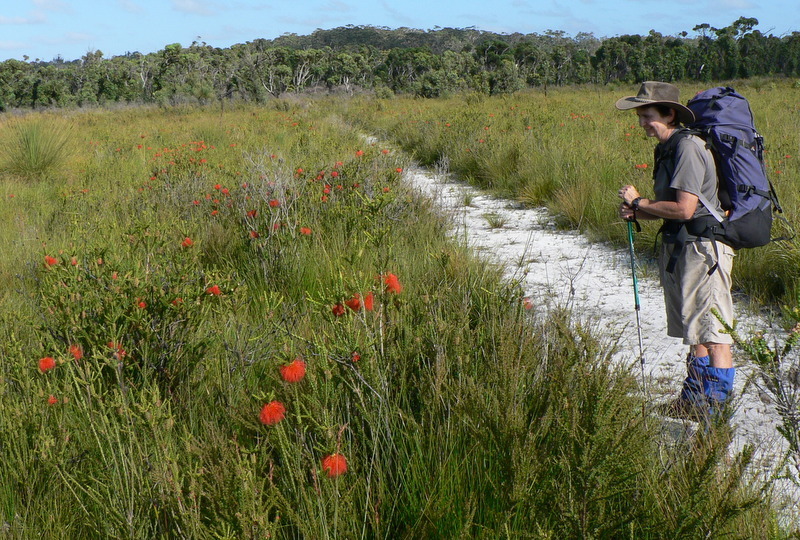 We are mostly walking across flood plains interspersed with hillocks of Karri forest, lots of wildflowers in the plains. Several mobs of red tailed Black Cockatoos go by, screaming their complaints about our presence. No other hikers. 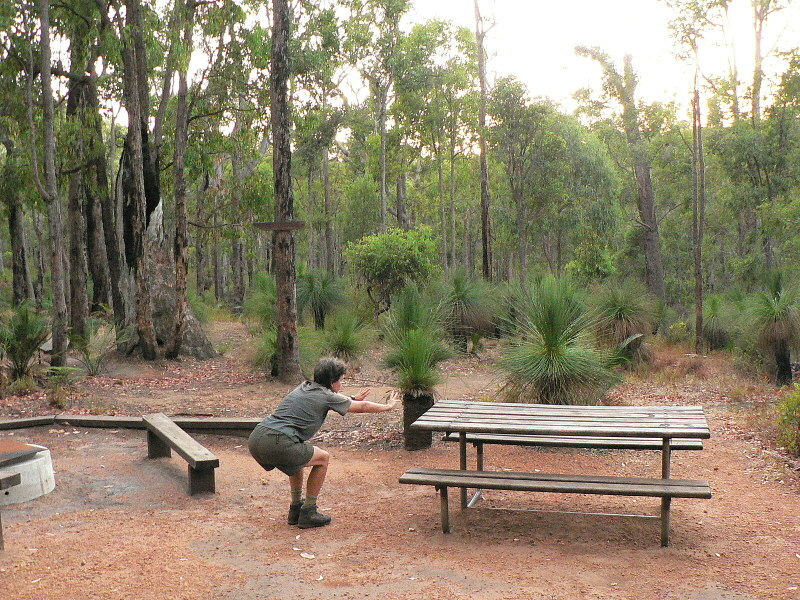 Wed 6th, Day 17 to Dog Pool, 19.4 km. We manage an early start, heading off into the cool of the morning by 7am. The first 7 kms slip by very quickly, but then we leave the Pingerups and head into forest using old 4wd tracks for the rest of the day. The last few kms along Marron rd in full sun on soft sand seemed to go forever but we arrive at Dog Pool for lunch and a swim to cool down. Great granite slabs plunging into deep black water, icy cold but a reviving place for the afternoon. 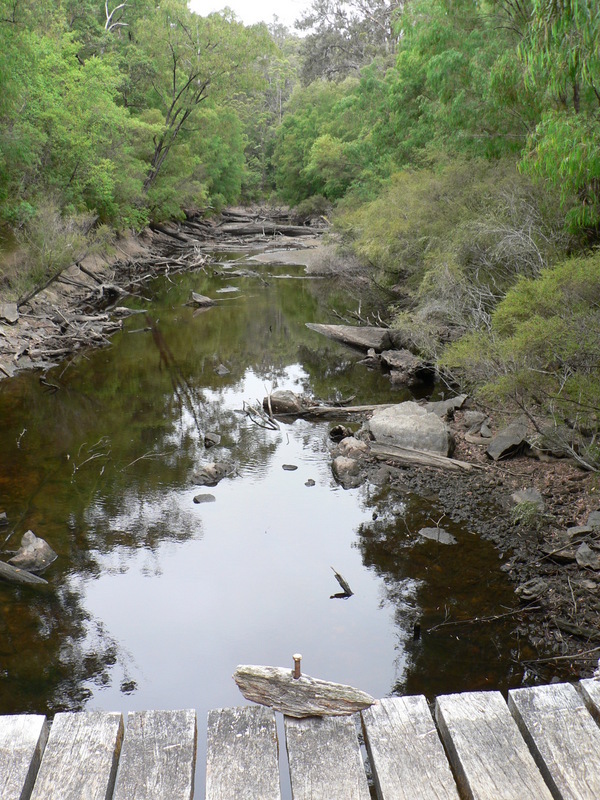 Thur 7th, Day 18 to Maringup, 25.6 km. We’re off early again for a long day on the trail, sadly it’s all a bit of a road bash but the wet swamps others experience are all dry. 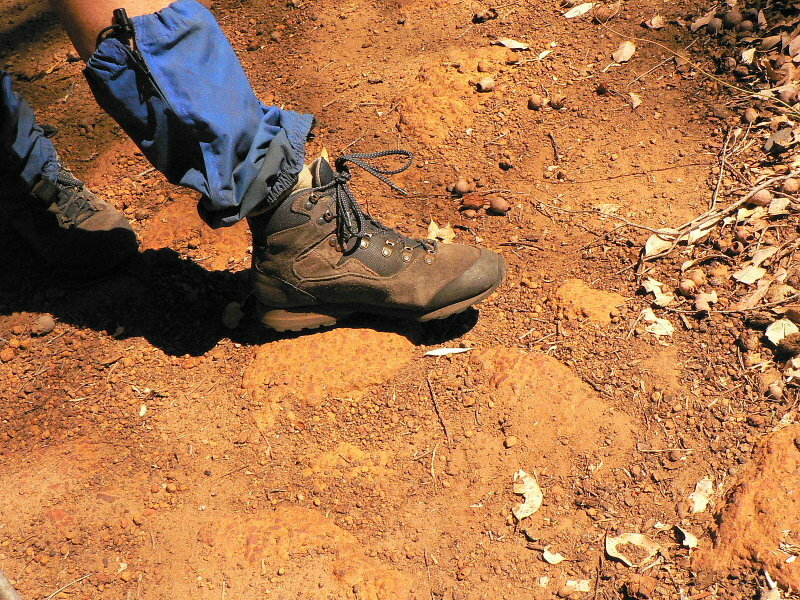 Log books record the stories of people trying to walk barefoot or up to their waist and of getting lost in the swamps trying to follow the invisible track. Lake Maringup could be a highlight but the wind is coming across the lake and all the debris is piled up along what could have been a beach. 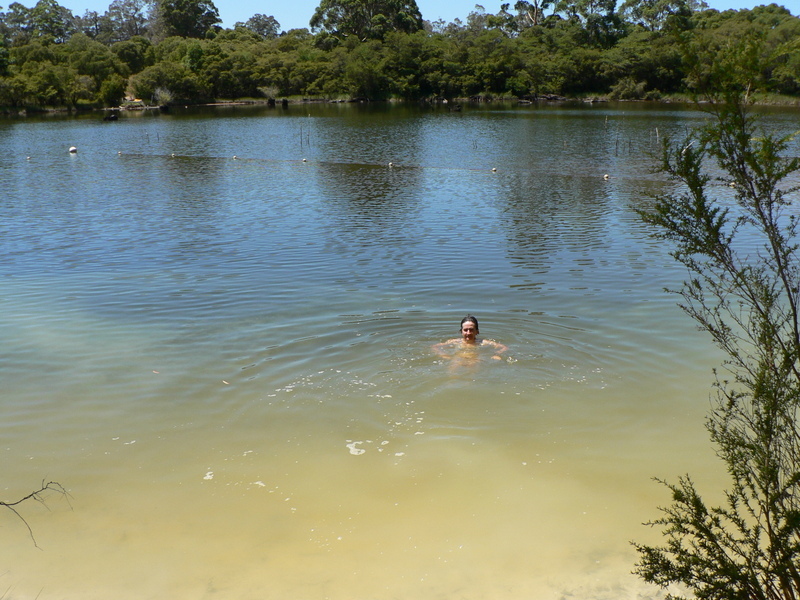 Knee deep leaf litter out into the water, means that you are swimming in dirty sludge. 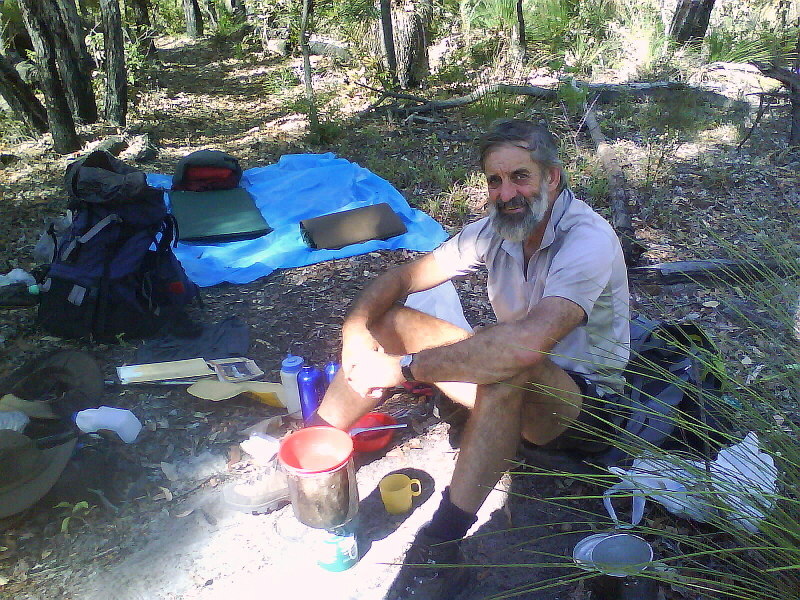 Fri 8th, Day 19 to Gardner Hut, 16 km. A short day, but the surprise was in discovering that the walking track had been “upgraded” by bulldozing it into a firebreak for an upcoming burn. The footpath is now a 4m wide blindingly white sand track with no shade. Sunglasses are essential. That this could be done to a “world class” walking track makes no sense. We are following a creekline, 2-300 m away, and it looks to us as if the track could easily have been diverted to the creek bank to maintain the wilderness feel. However we make it through to Gardner Hut and meet another walker, only the second time we’ve shared the hut in almost three weeks. Graeme from Perth shares his M&Ms and we discover that they don’t melt, crucial trail info that is news for us. We have also been lucky in that a March Fly invasion should have started by now but has been delayed, probably due before March. 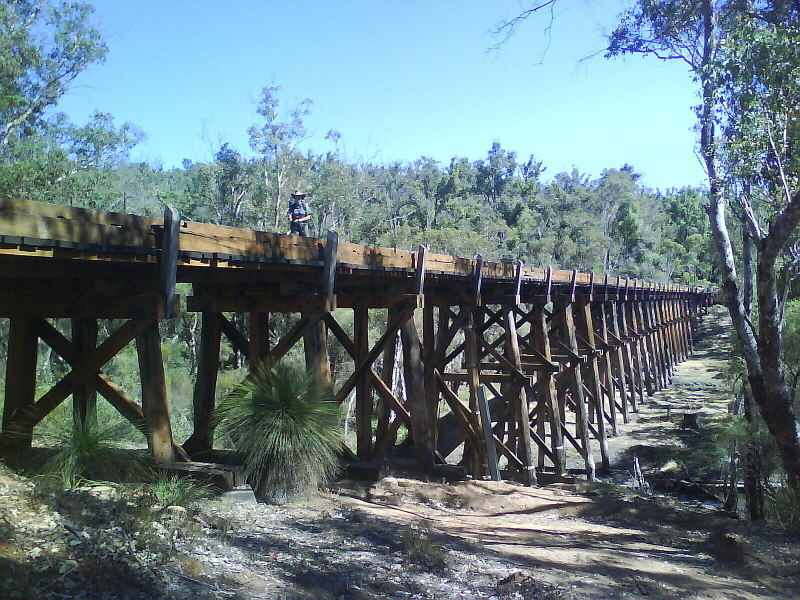 Sat 9th, Day 20 to Northcliffe, 15.1 km. Early starts are becoming a new norm for us and we are hoping to get phone reception to plan for tonight’s accommodation. Northcliffe motels get bad reviews, while the pub food gets raved about, apparently 9 veges with the roast dinner. We hit on a plan to stay 2 nights at Watermark Kiln B&B and see if they can collect us in Northcliffe and drop us off there in the morning. We are able to get in touch with our caretaker and learn that our older dog, Mia, has died at the vet after collapsing at home. Despite feeling down and sharing memories of the good times with Mia everything else goes to plan (Trail Magic #5). The hotel lunch is excellent but leaves us bloated and unable to sleep that night, but Jeanette from Watermark Kiln is able to do all the car shuttling for us as well as the 2 nights accommodation with dinner and breakfast. 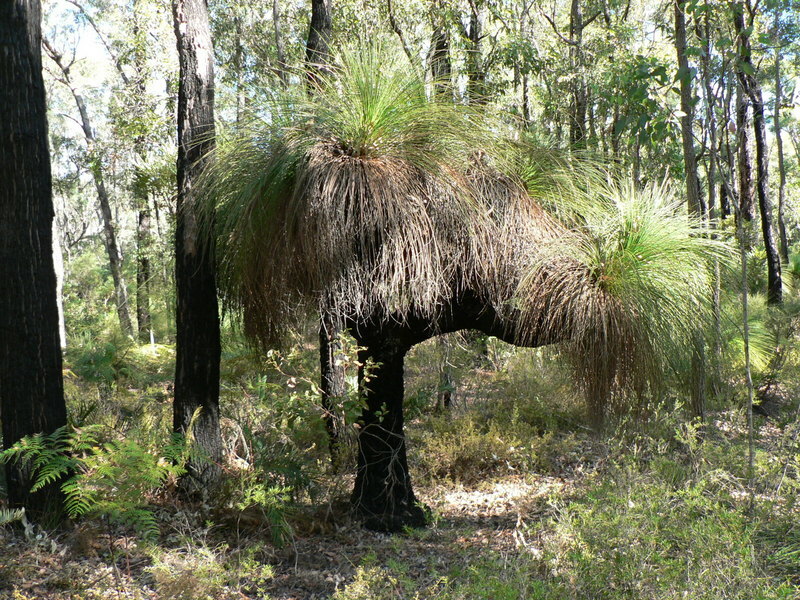 Sun 10th, Day 21 to Schafer Rd (Watermark Kiln), 12 km. 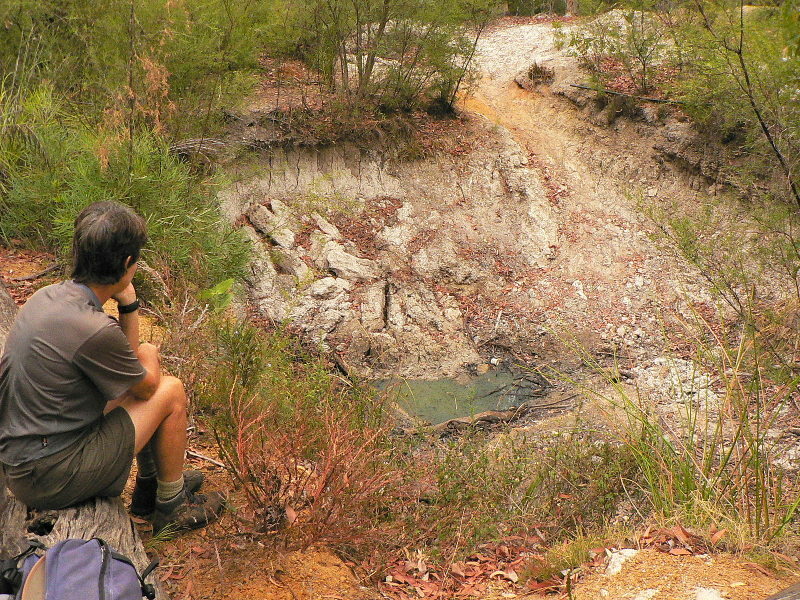 Jeanette drops us back in Northcliffe with daypacks to walk the track back to our cabin. We are mainly walking beside farmland, dairy and sheep then back into forest to discover the stump of “the world’s largest karri tree”. 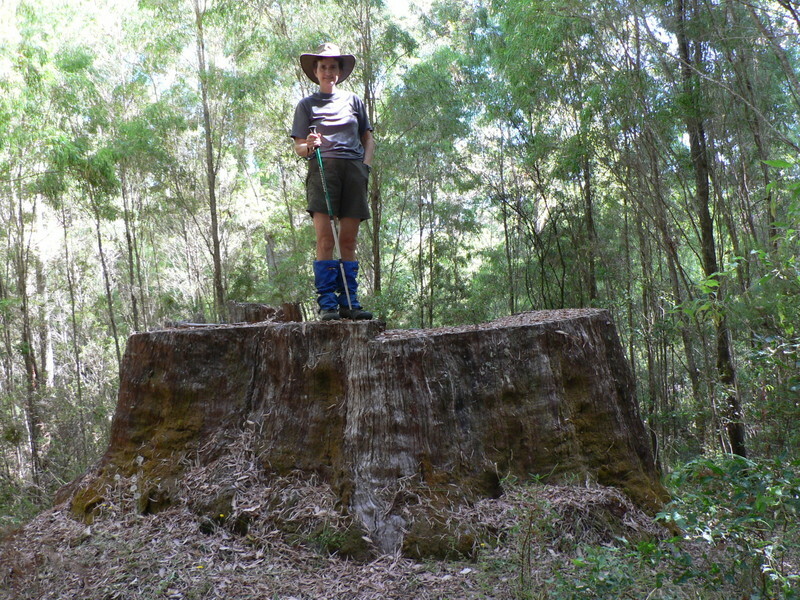 It is a sadly impressive 2m diameter stump. We get back to Schafer Rd and have directions to a farm dam for a dip before getting back to the cottage for an afternoon snooze. 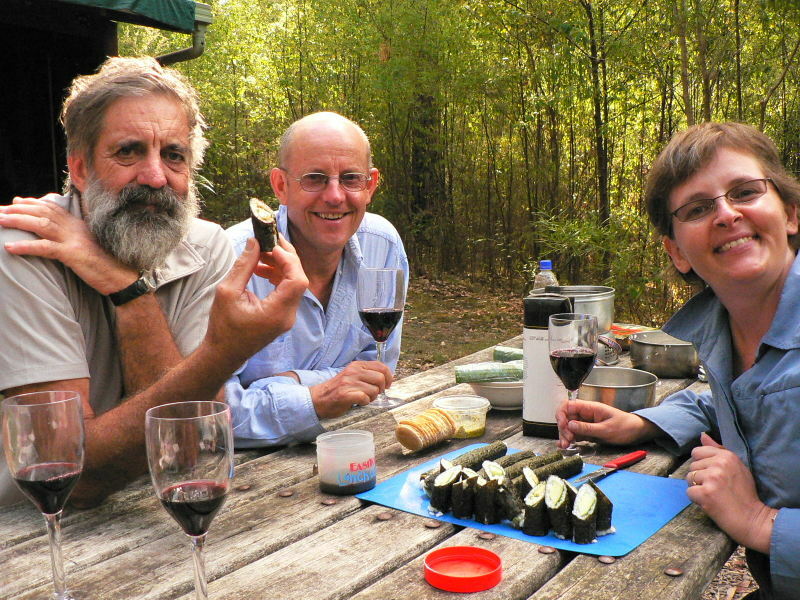 The dinner provided stays in our memory for ever, but just to make you jealous it consisted of fresh BBQ marron with garlic, home grown nectarine custard, home baked bread and real coffee. Another sleepless night due to overeating and remembering stories about Mia. Mon 11th, Day 22 to Warren, 21 km. Homemade bread again and fresh tomatoes for lunch after following forest trails down to the Warren River and a spectacular timber framed road bridge (now burned out). The shelter is high up on a ridgecrest and has very good phone reception, so we are able to book a room at the Pemberton YHA for a couple of nights. 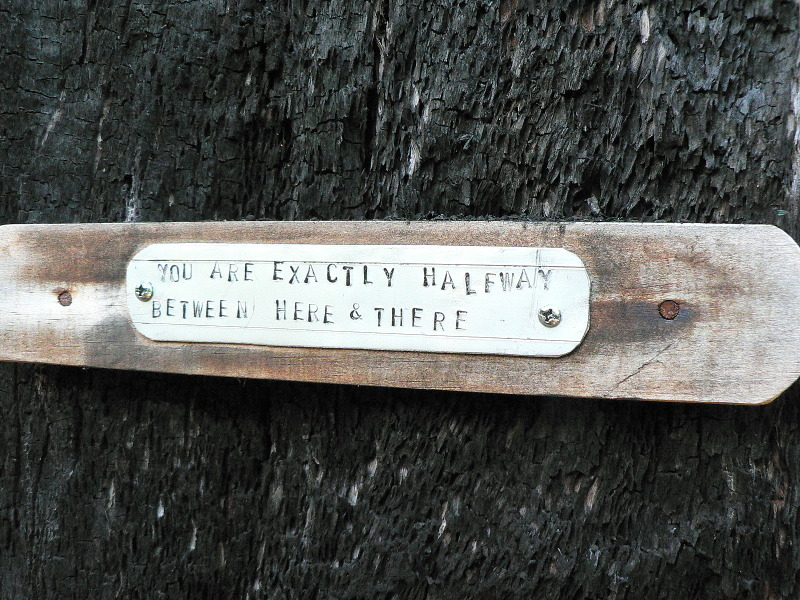 Tue 12th, Day 23 to Pemberton, 21.2 km. 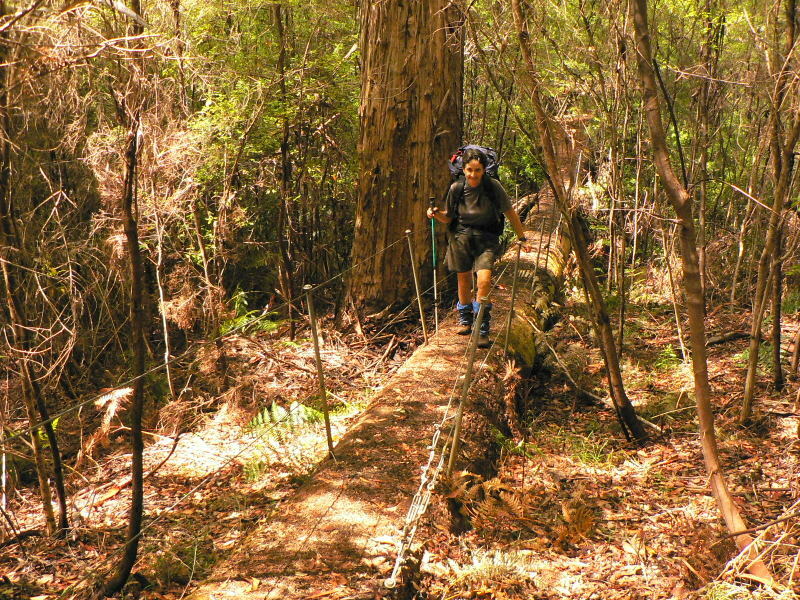 A fine and clear day, with the track following old pathways through the Karri forests. 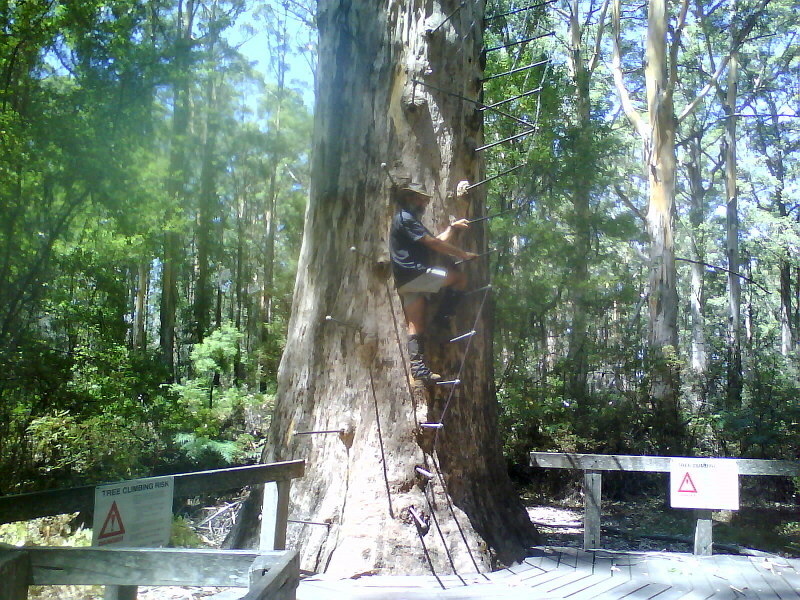 We climbed the Gloucester Tree (61m) on spikes in the trunk, still in use as a fire tower. Then 3 km on a bitumen path into town. Pemberton has a very appealing cottage landscape, entire streets of very small timber houses with the mill still operating on the edge of the town. The mill whistles shattering the peace at 6 am and 6 pm every day, echoing the times when a worker couldn’t afford a watch. Treats of good coffee and cake at the Mill St Café opposite the YHA. The only drawback is that the town is too hilly to wander aimlessly. Wed 13th, Day 24 rest day in Pemberton. We sleep in and miss the Kevin Rudd apology to the stolen generation. Catch up on emails and call Taryn and Craig to arrange to walk with them for a day when they bring in a resupply for us. We go out on a tourist cruise of the Donnelly River most of the other tourists are even older than us. Intense sun burning us through the glass canopy of the boat until we get down to the sand barrier near the coast. We strip and swim in the lagoon. Tea and blueberry muffins on the return trip. Dinner at the Shamrock café with smoked trout and a local Sav Blanc. 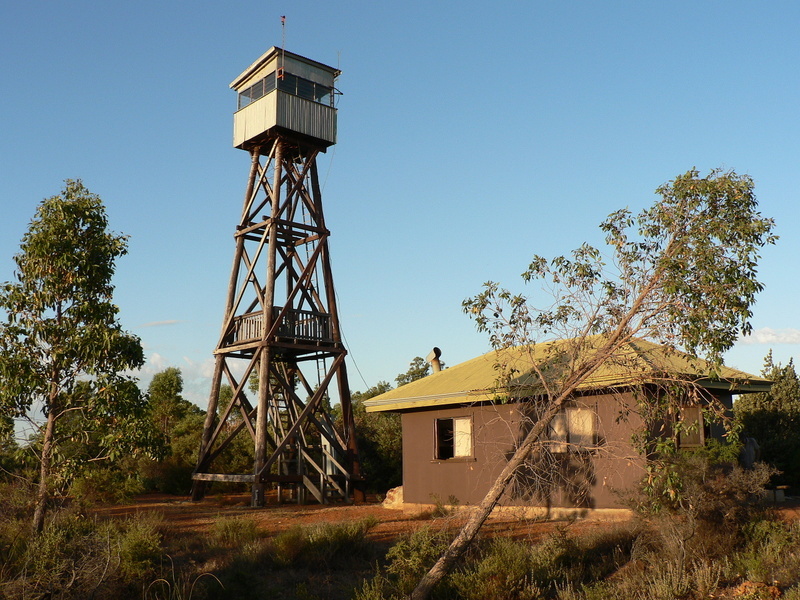 Thur 14th, Day 25 to Beedalup, 23.7 km. A really hot day with us starting early but unable to get into an easy walking rythym. Our feet soles are needing massage every few hours. Most of the walking is along tracks in forest so some shade but there is no-one else walking. 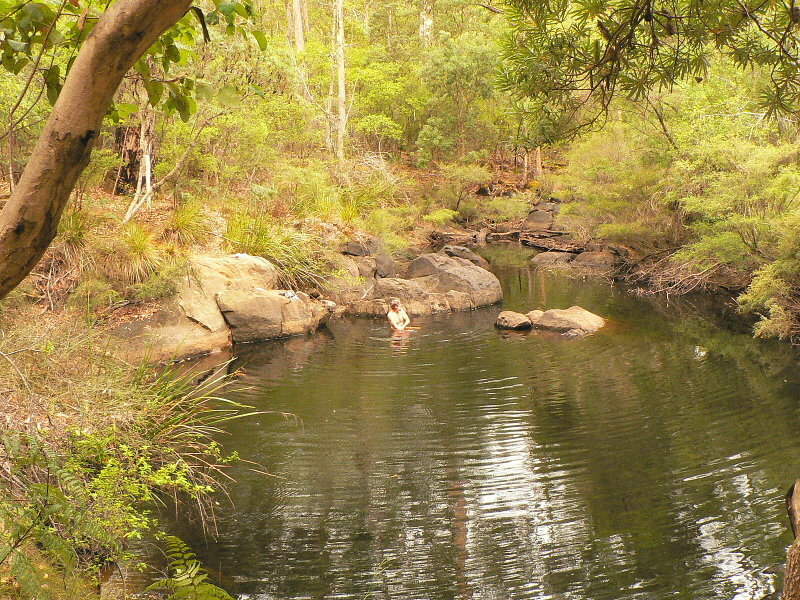 We manage a swim in a farm dam at lunchtime, and again at the shelter which has a great swimming hole in the river alongside. We bucket wash in the freezing water but the toilet is 200m uphill, because of the nearby river. 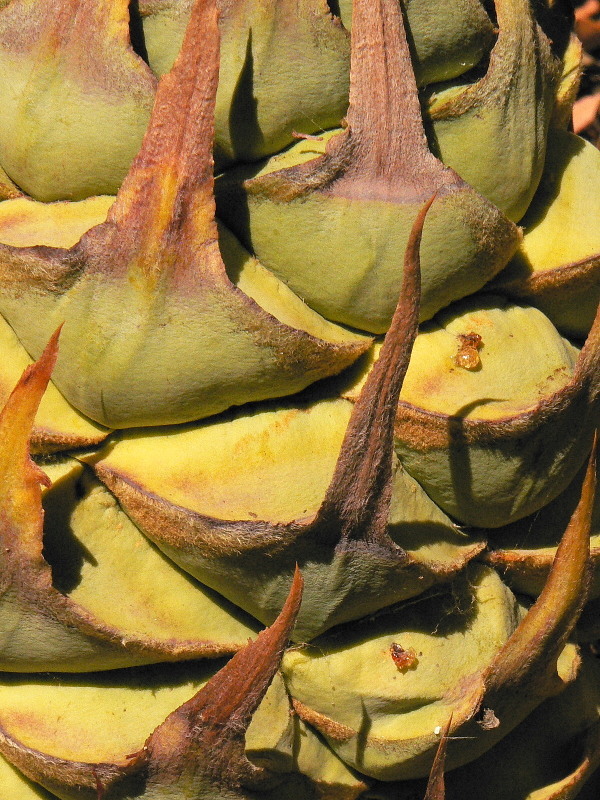 Fri 15th, Day 26 to Beavis, 19.8 km. We manage a sleep in and finally get moving by 7:30 into a cloudy day. Beedalup Falls have only a trickle going over and we get great views of Karri Resort Lake in the morning mist which develops into a spatter of rain. No parkas required but it makes the walking quite humid as the overcast remains. We’re following a river, but there are still many PUDs (pointless up and downs) to make life annoying. We arrive at Beavis Hut around 2:45 and settle in with the rain coming and going for the remainder of the day. The forest over and around the hut puts us in the orchestra pit as the trees drip steadily but randomly, pinging off the hut roof for hours after the rain stops. Sat 16th, Day 27 to Boarding House hut, 19.2 km. There are 4 steep ascent and descents today of over 100m, making this one of the most demanding days for the entire trip. We start early and get through the “hills of death” before lunch and have only 3 km to go when Taryn and Craig appear walking towards us. 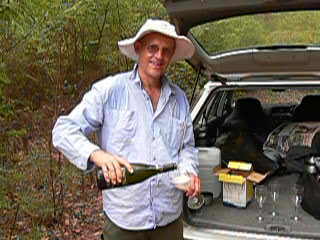 They have champagne to mark our halfway point (479km) and we deal with that celebration on the spot. They walk on with us and stay at the hut for the night having brought in a resupply for our next few days as well as sushi, red wine and a lentil salad for dinner. Sun 17th, Day 28 to Tom Rd, 22.9 km. Walked along the river pack free as Taryn and Craig have driven with them down to one Tree Bridge and will walk back to meet us at the Graffiti Café for lunch. 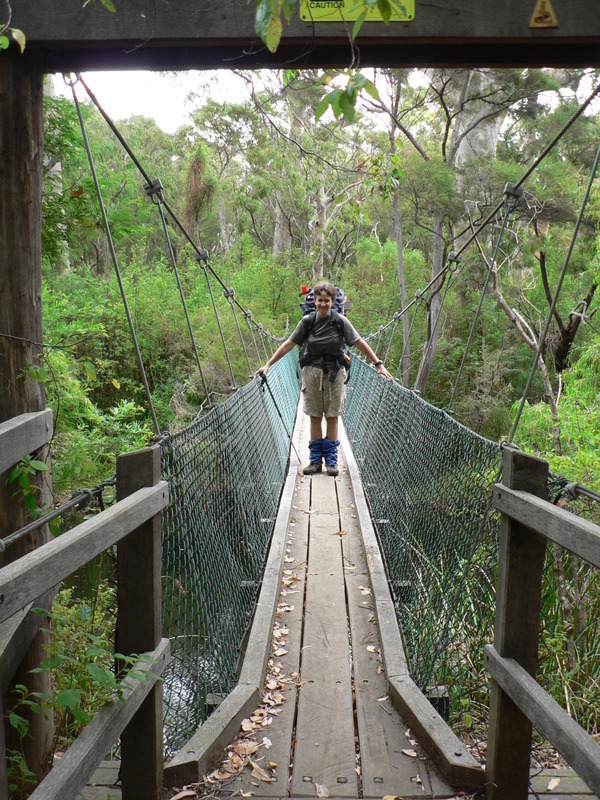 We say our farewells and head on with full packs and tummys for 11km for the afternoon walk to another great hut and swimming hole on the Donnelly River. This place ranks up with Dogpool as our favourite spot. 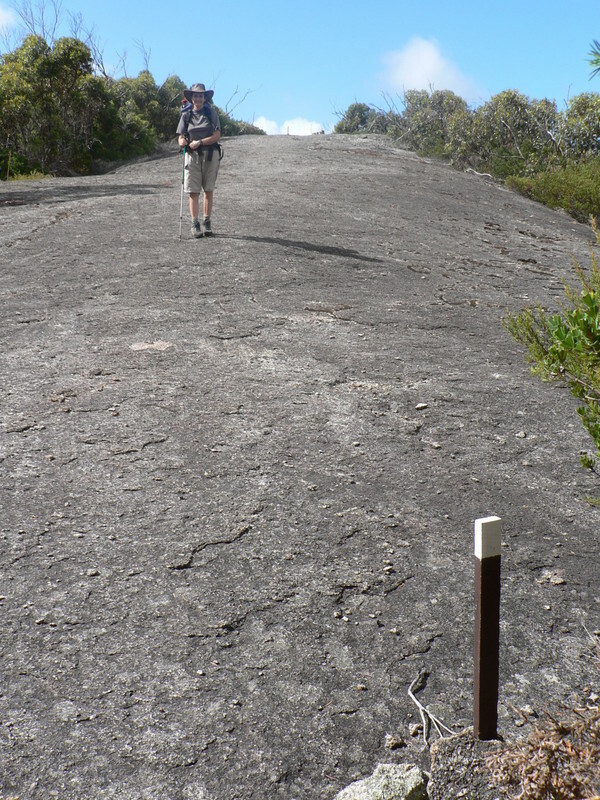 Mon 18th, Day 29 to Donnelly River Village, 16.1 km. A fast walk this morning through logged forest with the remaining open forest burnt out. A satellite phone on the trail is an odd discovery, so we collect it for delivery into the village tonight. We later find out that it had bounced out of a ranger’s back pack while on patrol on a quad bike, and he was very pleased to get it back. 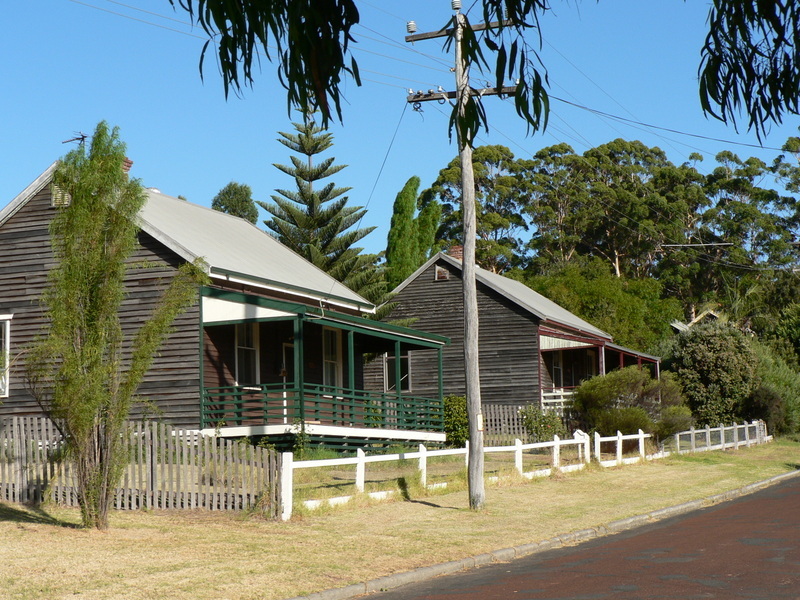 Walking into the village is like going back in time, with its streets of timber houses, now available for let as holiday homes. 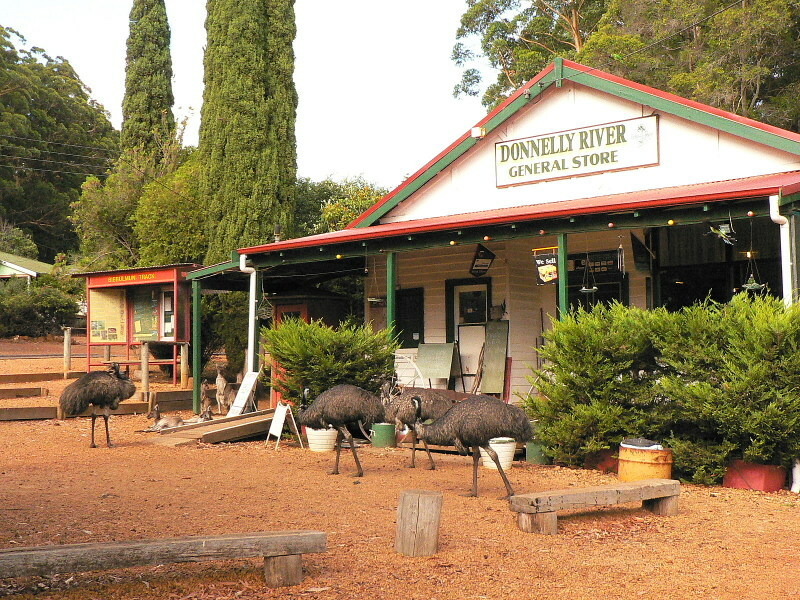 At the general store they are handfeeding the wildlife, so we get mobbed on arrival by about 8 emu and 15 grey kangaroos. We check into the Loco Shed B&B with Ellie and Graham. Ellie cooks us dinner which we have by the fire with a bottle of red. Graham is recovering from a stroke and pneumonia. We snuggle into bed, (its cold! 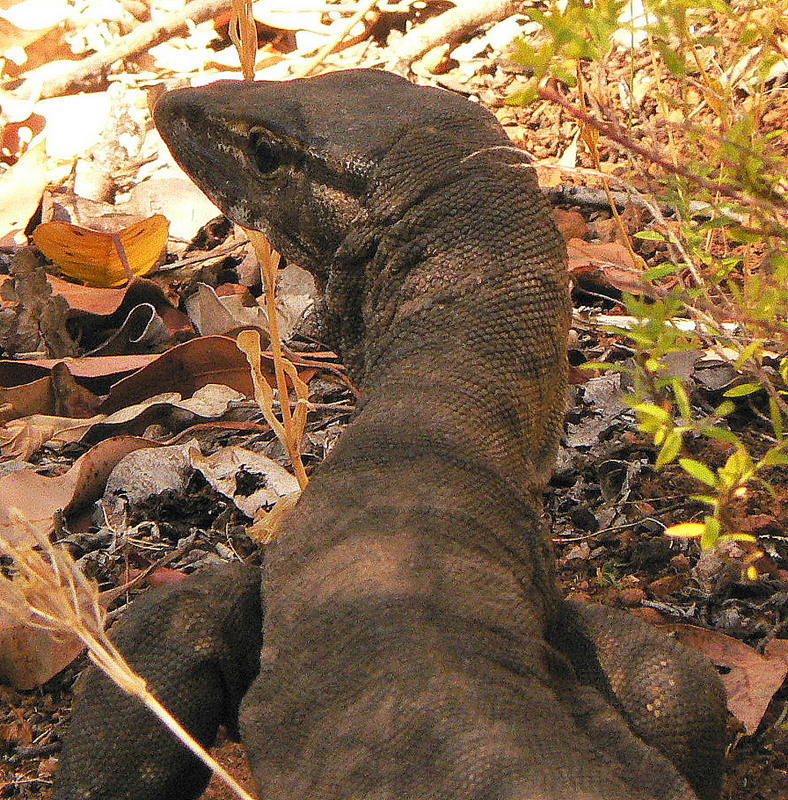 ), under a doona. Tue 19th, Day 30 rest day again! 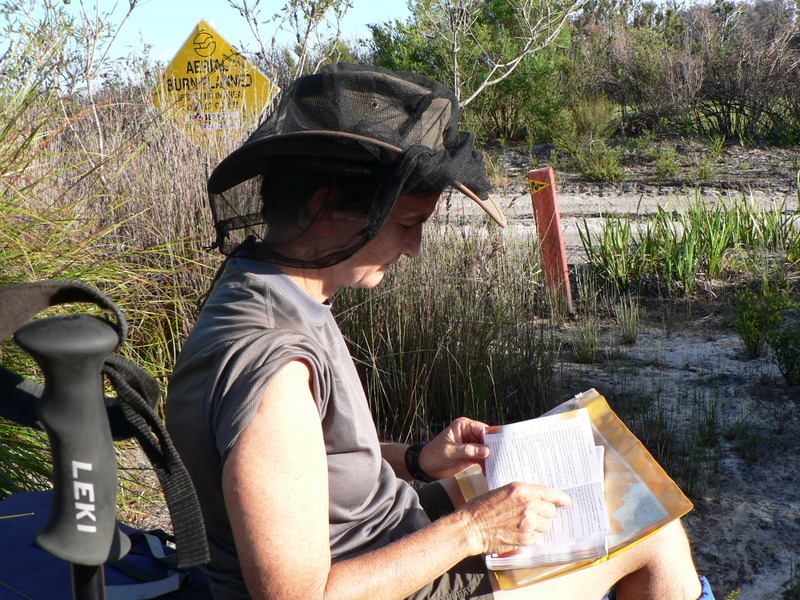 Wed 20th, Day 31 to Gregory Brook, 19km. As we depart at an earlyish 8am, we can see our breath in front of our faces. Now that’s freezing for a tropical couple. 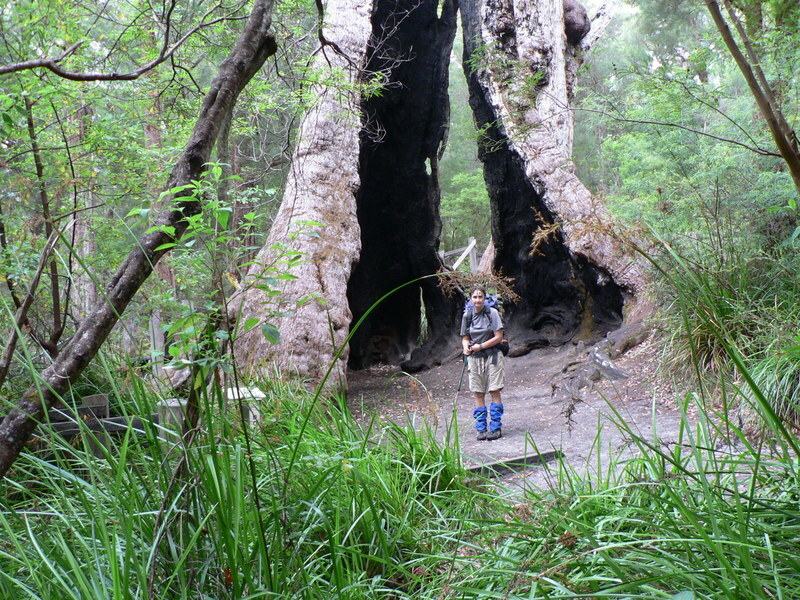 We walk through forest remnants along old logging formations and finally leave the Donnelly River watershed. There are several picnic sites at old sawmill locations and we meet another couple of walkers on an 8 day walk in training for Nepal. We arrive at Gregory Brook to find a dry creek bed, but still many birds around. The evening chill descends, so we eat early and retire to sleeping bags. 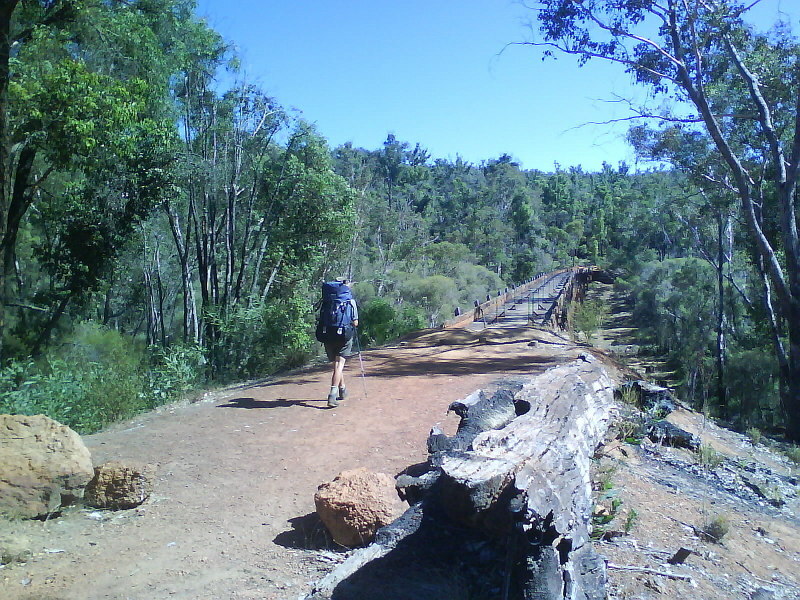 Thur 21st, Day 32 to Blackwood, 18km. Another freezing start to the day, with Ali genuinely cold overnight despite wearing socks and fleece in her sleeping bag. The day’s highlight is eating handfuls of blackberries along the South Hampton River. 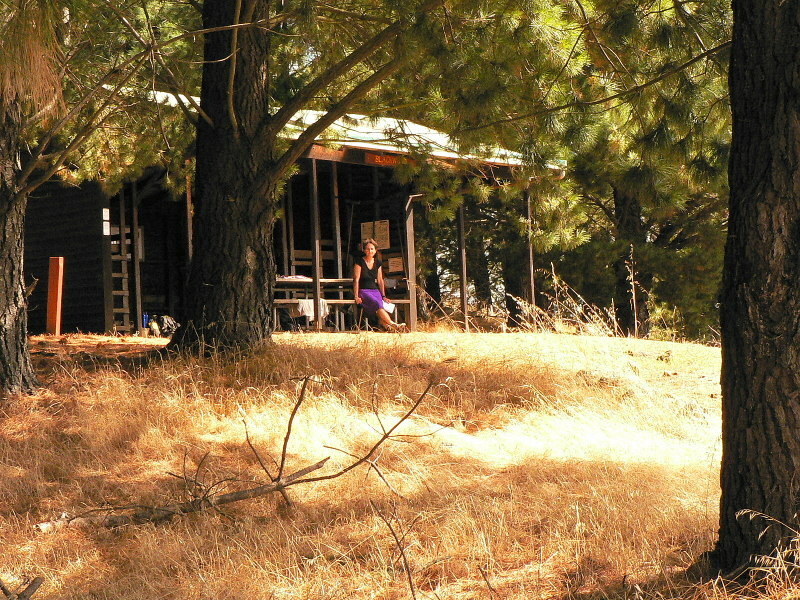 The hut is perched high on top of Cardiac Hill amongst pine trees which are whistling all night in the breezes. Great views off through farm land and pine plantations. There is even good phone reception and we manage a call home. 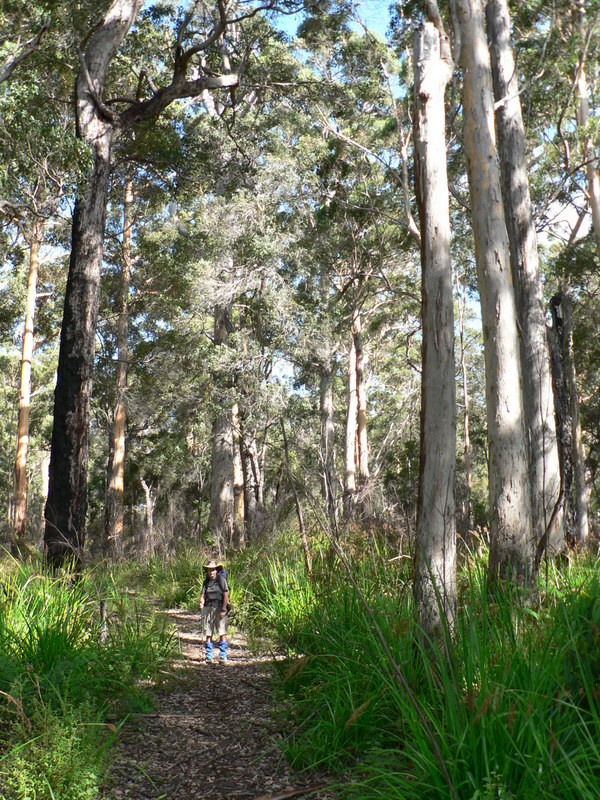 Fri 22nd, Day 33 to Balingup, 17.6 km. We drop steeply off the mountain and loose each other for a while when Ali stops to take a flower photo, then misses a trail junction. Then there is a bit of to-ing and fro-ing up and down hills until we meet up again and continue together. Remnants of tin mines through the Greenbushes area, convict built cobbled roads and an arboretum at Golden Valley before the slog along roads into town. We are impressed by the super friendly and helpful people at the Bronze Gallery who also do a spectacular beef burger for us. We are able to arrange to stay at Oakfield B&B, a colonial style mansion high on a hill with great views. Ruth will collect us this afternoon and bring us back down the hill tomorrow morning. 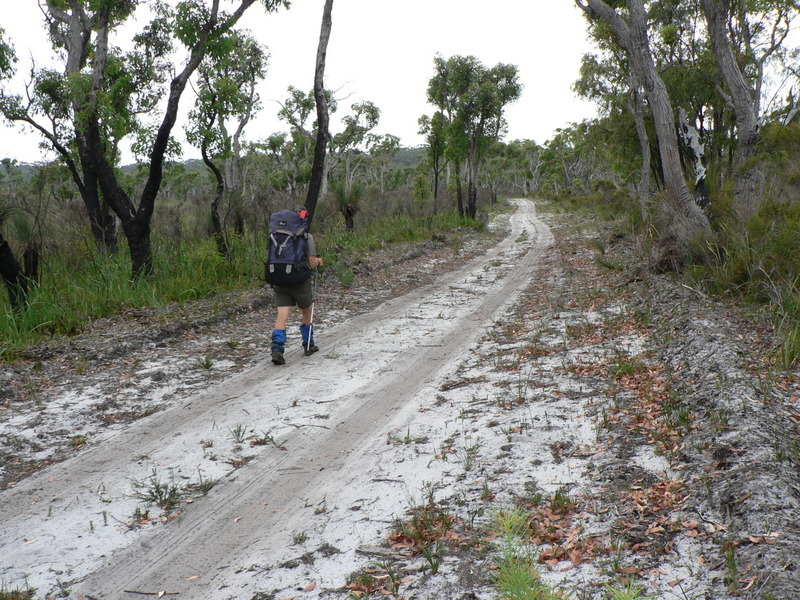 Sat 23rd, Day 34 to Grimwade, 22.5 km. Our treat for today is a baguette for lunch but we have to light a fire to cook dinner for the first time as there was no gas to be had in Balingup. Grimwade hut is the first time the hut floor has been bare of wood chips, so there is dust over everything. We are able to call Bruce and Leeanne at Wanjedda Farm to book a night and be collected again from the track. Its an extra 6 kms on from the normal stop, but we decide to go for it on Taryn’s recommendation. Sun 24th, Day 35 to Wanjedda B&B, 27.6 km. A lovely walk through open forest with lots of orchids along the way. The last 6 km is a bit of a slog, but we hit the road, find the style and call Bruce who collects us in the farm ute. They are another couple of kms away down and up the hill, so we are glad of the lift. Lovely welcome with cuppa and a biscuit and set us up in a separate guest wing with 1800 views down the Balingup valley. 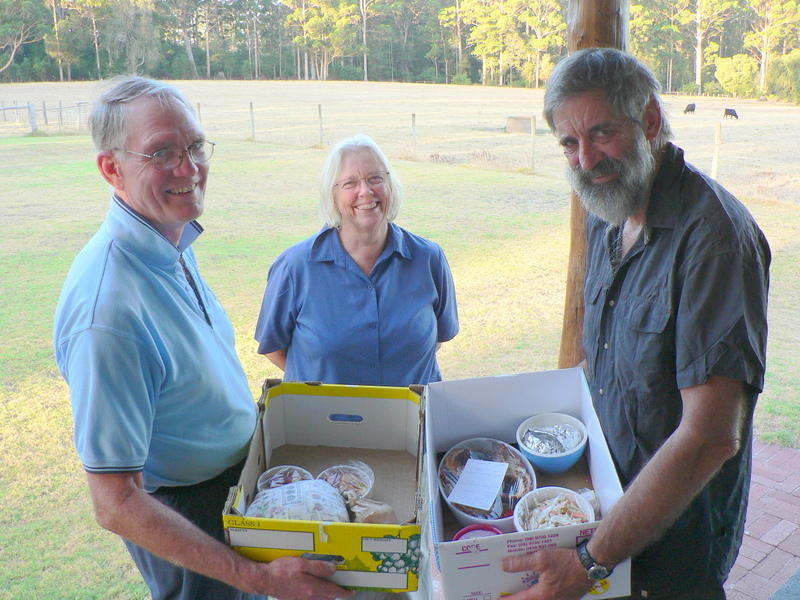 They join us for dinner around a superb Jarrah dining table and we learn that they have sold up and retired from their orchard just across the valley. The new owners are bulldozing the fruit trees, (apples, peaches and nectarines) which once employed 10 people. 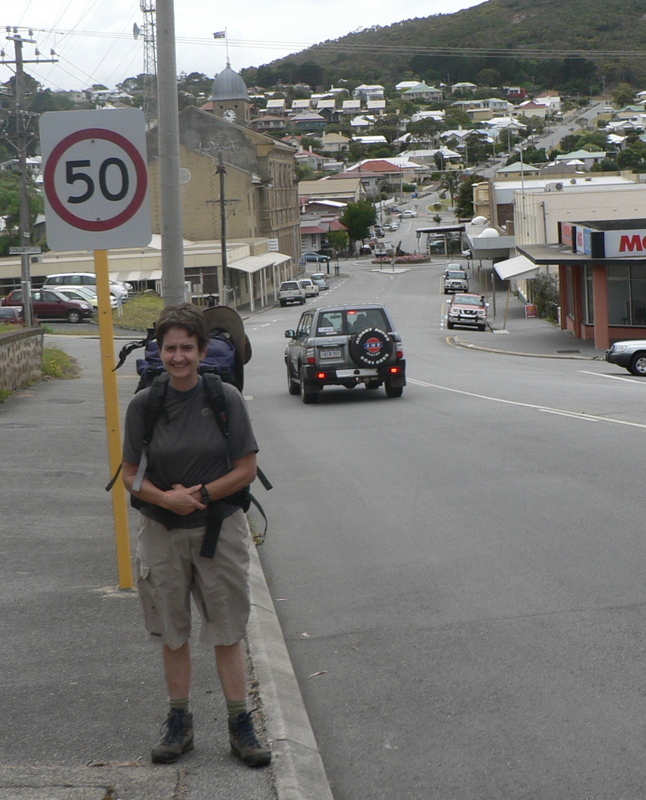 Mon 25th, Day 36 to Collie, 20.5 km. Bruce drops us off back on the trail, but down in the valley, saving 5 km of downhill slog, and enabling us to make it through to Collie for tonight. It’s another 36 C day with little shade and no wind so after 20 kms, we’re over it and decide to call for a taxi. Trail Magic works again and 5 minutes later we are collected and dropped off at the caravan park for $10. We are able to recover enough to walk into Collie to do a major shop, find gas bottles, have a milk shake, buy cider and satay for dinner. We’re able to watch tellie, read the paper and cook our own dinner on the Barbie while boozing in peace. Bliss. Collie township is difficult for us with the crowds of people in shops, queues, noise, fatties etc. Tue 26th, Day 37 to Harris Dam, 22 km. An early start gets us out of Collie, but we miss the track at a railway crossing and waste 30 minutes looking for it. It’s another hot and windless day but the forest is able to provide some shade for most of the day. Harris dam for lunch, but no swimming in the water supply. We lounge around in the picnic area for half an hour before taking on the final 3 km steep climb to the hut. Heavy packs with 7 days food, so we are glad to collapse at the hut. 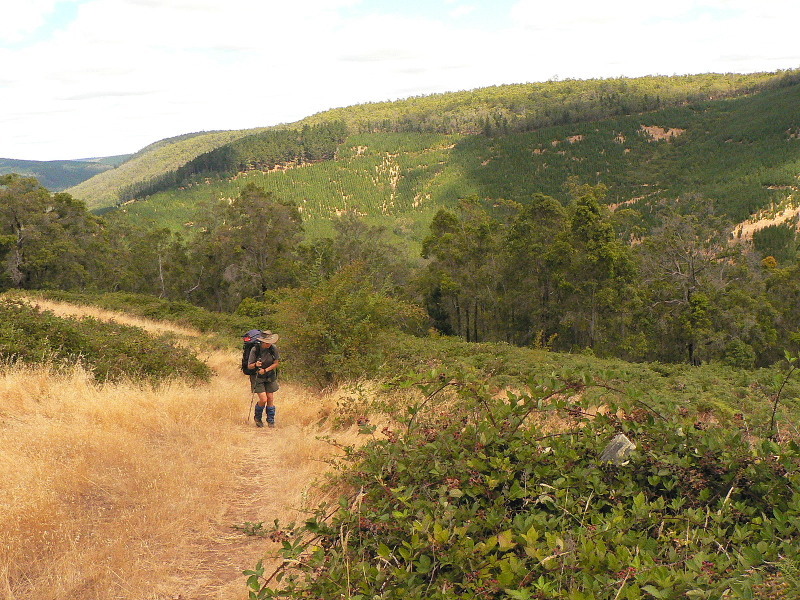 Wed 27th, Day 38 to Plonk Hole, 26.7 km. We’re off by 7 am as it’s going to be another scorcher and we’re hoping to skip the next hut. We pick up some water to carry for the night at Yourdenning hut when we stop for lunch. By 4 pm we’re pretty exhausted by the heat so decide to stop although Plonk Hole by Plentitude is dry. The evening is mild and clear, so we decide to wild camp in the open on a sandy stretch of track. Starry starry night is so bright, we need sunglasses for sleeping! Thur 28th, Day 39 to Dookanelly, 25.4 km. We’re off in the dark today walking by the light of a headtorch for 30 minutes or so. The track signs are reflective paint and they really glare back at you, so we can’t lose the trail. 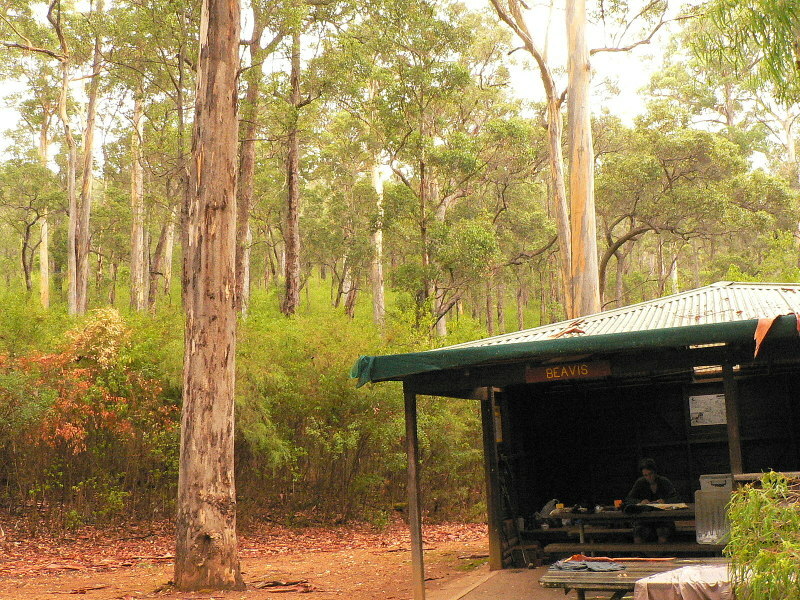 We stop to rehydrate at Possum Springs after 6 km. The track continues over rolling hills, but we are accompanied by the constant rumbling of a conveyer belt carrying bauxite 60 km to the smelter. The noise is audible for 20 km both sides of the line, just unreal to come across in the bush. 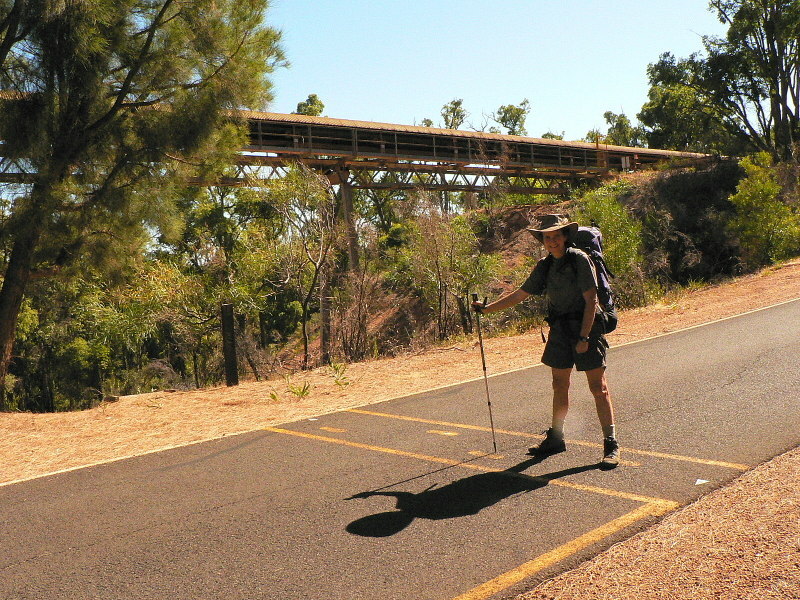 We carry on to the Long Gully bridge (now burnt) and bypass the next mountain by following the flat road around it. We make good time and arrive at the boundary fence of the Bunnings plantation. The track now follows the fence over 4 steep hills on loose sand and its really hot. We finish our water at the top of the last hill and still have 3 kms to go. We’re a bit stressed, but we manage to arrive at the hut by 3 pm to find a thermometer in the hut showing 46 C. No wonder we’re stressed. 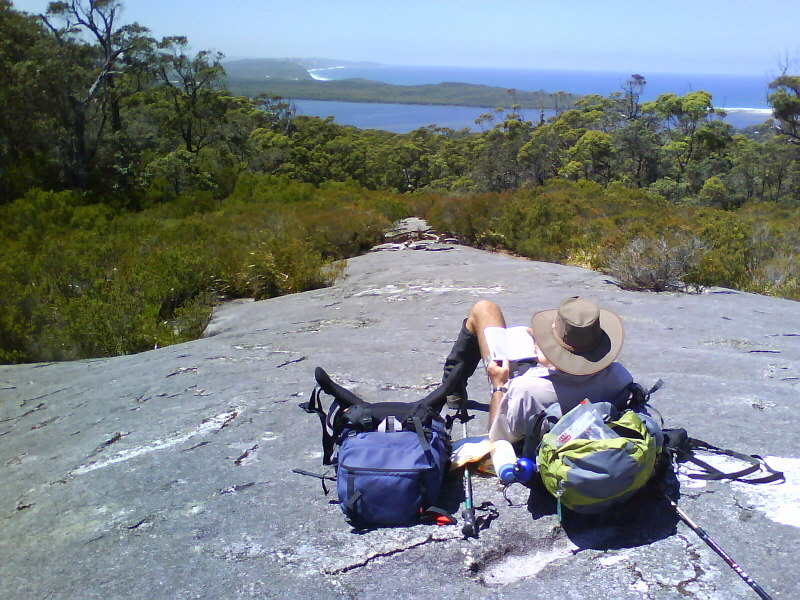 Fri 29th, Day 40 to Murray Hut, 17.7 km. Today is a gentle one after the last couple, and it starts with a wander down to Driver Rd with happy little signs put up by the Mad Axeman who does the track maintenance in this area. The track follows the river, with one steep hill to remind us about who’s in charge, so we’re able to cool off at lunch, as well as having several dips at the hut. Clothes are washed as well, so all is well with the world again. 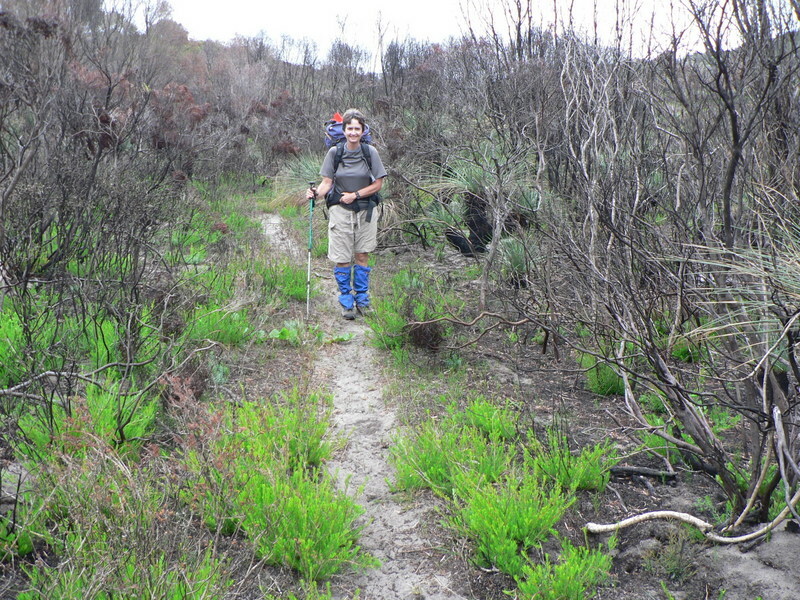 Sat 1st March, Day 41 to Swamp Oak, 18.6 km. 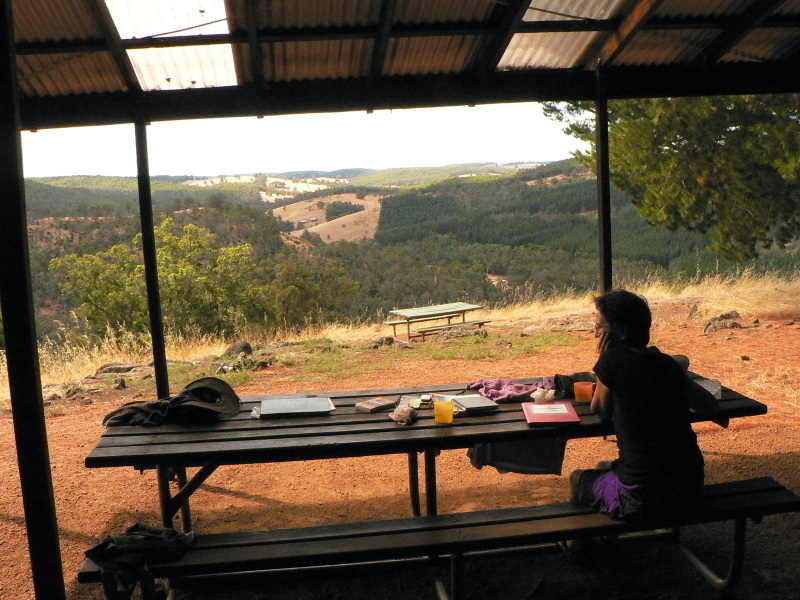 Sun 2nd, Day 42 to Dwellingup, 13.1 km. An easy walk again today into town with blackberry bushes lining the pathway through pine plantations. 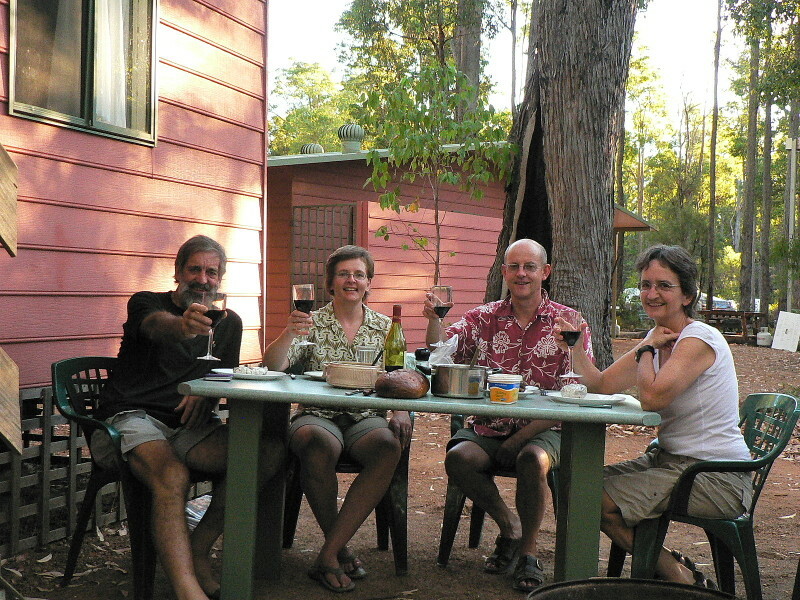 It’s a long weekend so the town is quite busy but Taryn and Craig can join us, and the caravan park has cabins available so they decide to stay and help us BBQ dinner and drink cider. A very pleasant evening sitting around in the cool. 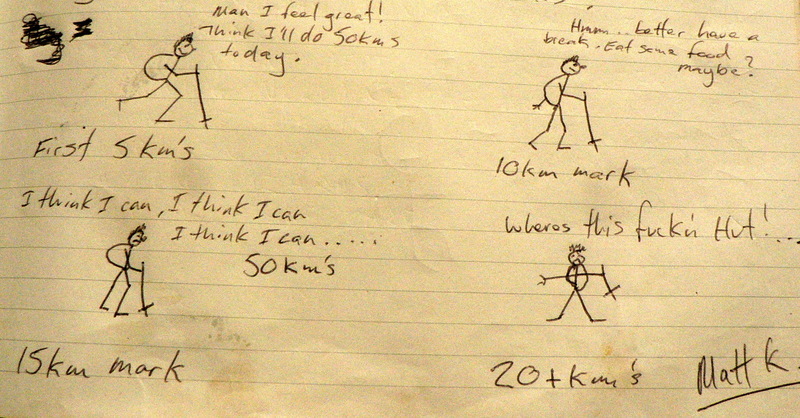 Mon 3rd, Day 43 to Chadoora Hut, 19.4 km. We’re able to dump spare gear like tent and tevas with Craig and Taryn to hold and we arrange to meet them on the track in 4 days. We’re walking with bare essentials now ( but learn later we can cut this even more). It’s flat walking along old railway tracks through forest burned out 2 years before, so it’s still looking blackened, but the epicormic shoots are coming through and the grass trees are covered in new growth and are hiding the logging scars very well. We are joined in the hut for the night by two solo hikers, both older males, so the night is disturbed by the snoring. 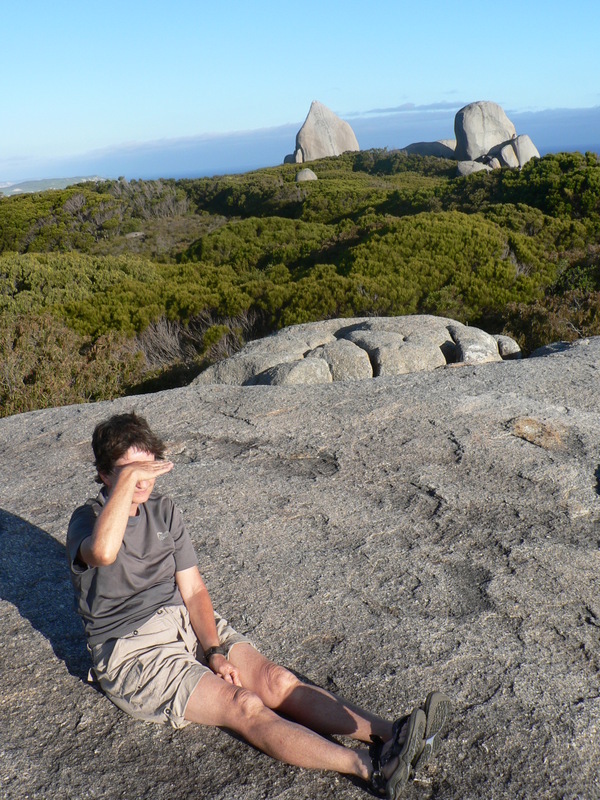 Tue 4th, Day 44 to Mt Wells, 14.8 km. Light packs have us charging up the track so the steep climb up Mt Wells was over before we realised. 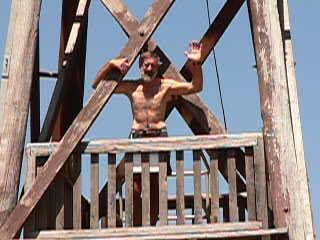 A clear blue sky and a light breeze on top with great views all around from the platform below the fire lookout. We laze away the afternoon, but the sunset is worth the early stop. Wed 5th, Day 45 to Whitehorse Hills, 14.6 km. A fast descent off Mt Wells gets us into Whitehorse by early afternoon. 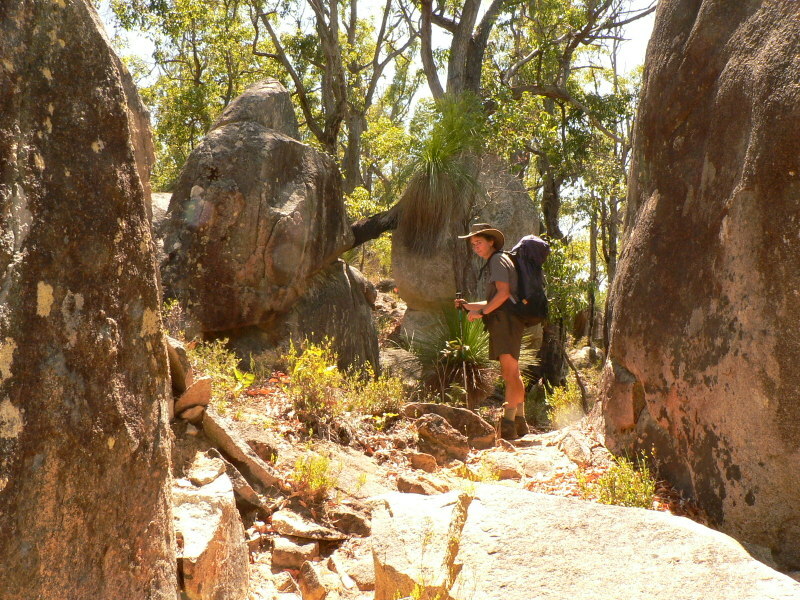 The area has been logged out but some granite boulders provide shade and interest. There are honey bees pestering us for our sweat, so we set up some water with sticks for access and tell them about it. It’s all gone by sunset in 3 different directions. 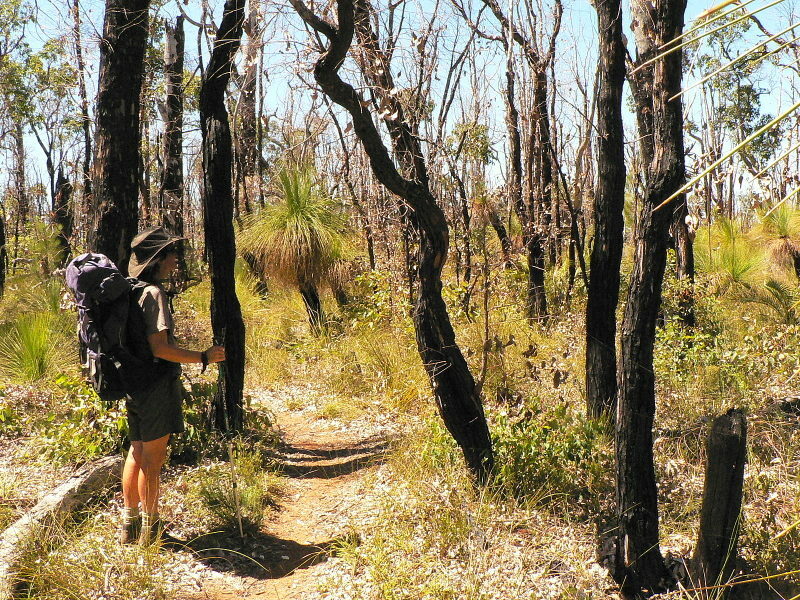 Thur 6th, Day 46 to Gringer Creek, 17.6 km. 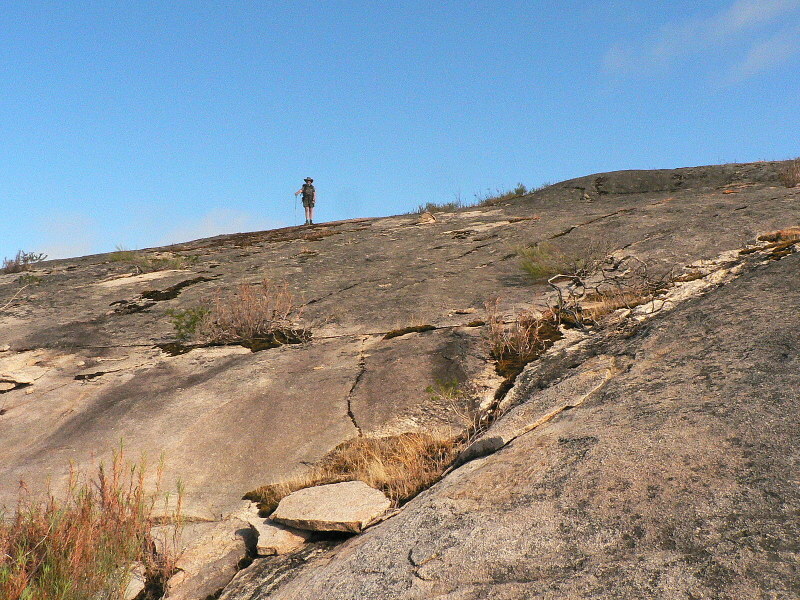 We’re walking through open woodland before climbing up and over Boonerring Hill, a huge granite monolith. A permanent spring along our route turns out to be a 2m diam muddy pool full of tadpoles. 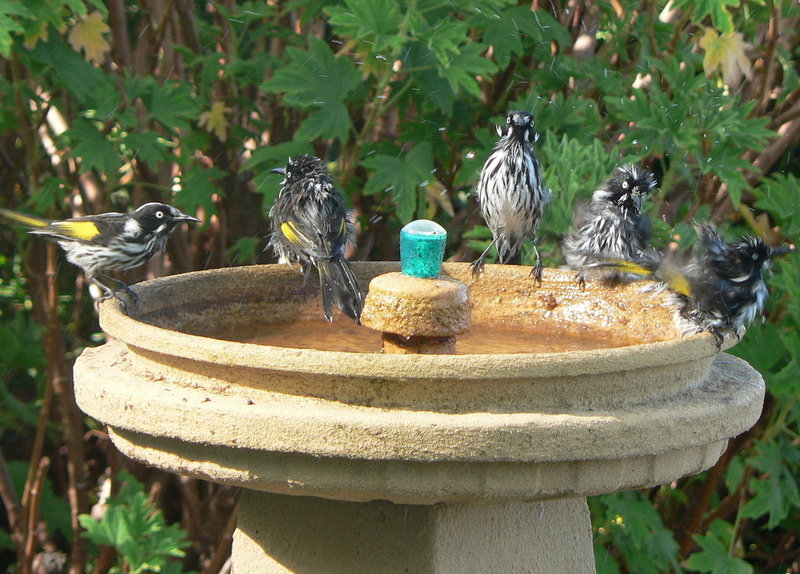 The small birds are happy, but we don’t need water that badly. Blue Gum plantations fill the air with eucalypt as we reach the Albany Highway and cope with fast cars and trucks roaring past for a few hundred metres. The area around Gringer Creek has had a recent fire and is still unsafe, so a detour around it takes us around 3 sides of a square. Craig and Taryn arrive at the hut at 6:30 with roast chicken, chocolate and cider etc and our resupply for the next 6 days so we have another pleasant dinner and evening before they head off home. A text arrives next morning to let us know that the pub a km down the road that we believed to have closed, had in fact reopened, so we could have spent the evening there instead. Ah well, it was still a great night. 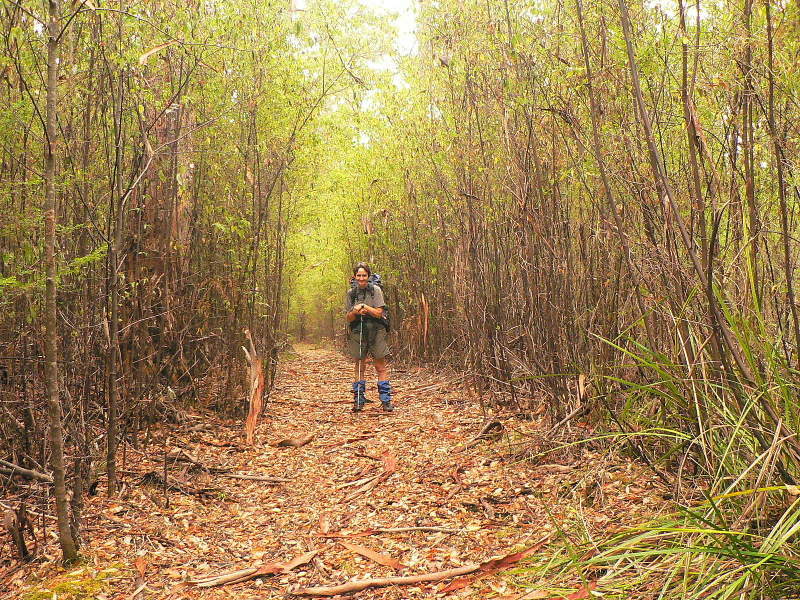 Fri 7th, Day 47 to Nerang, 16.6 km. 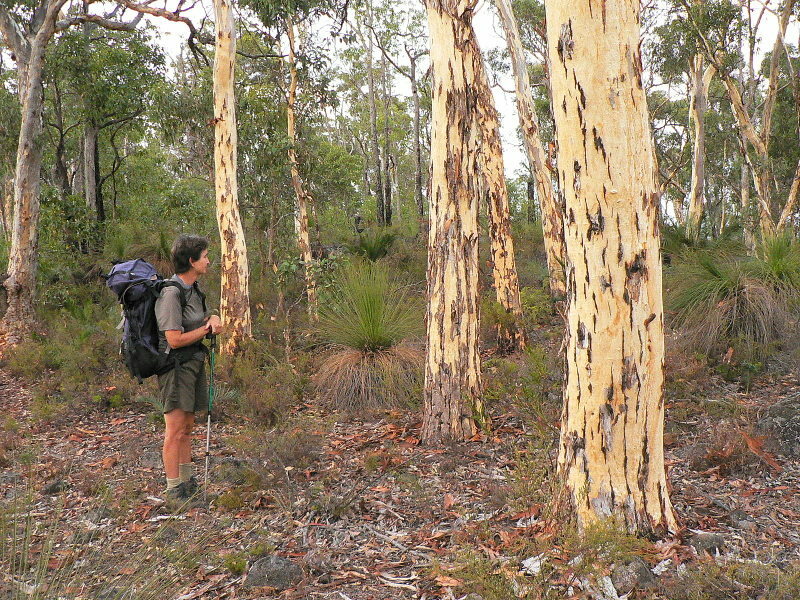 Another very easy day along dead flat pathways through wandoo eucalypt woodland, white gums lining the track. Spend the afternoon relaxing by the shelter, wondering whether we should have just kept going, or even double hutted. Sat 8th, Day 48 to Monadnocks, 25.3 km. A double hut day climbing over 3 peaks so we’re off early. 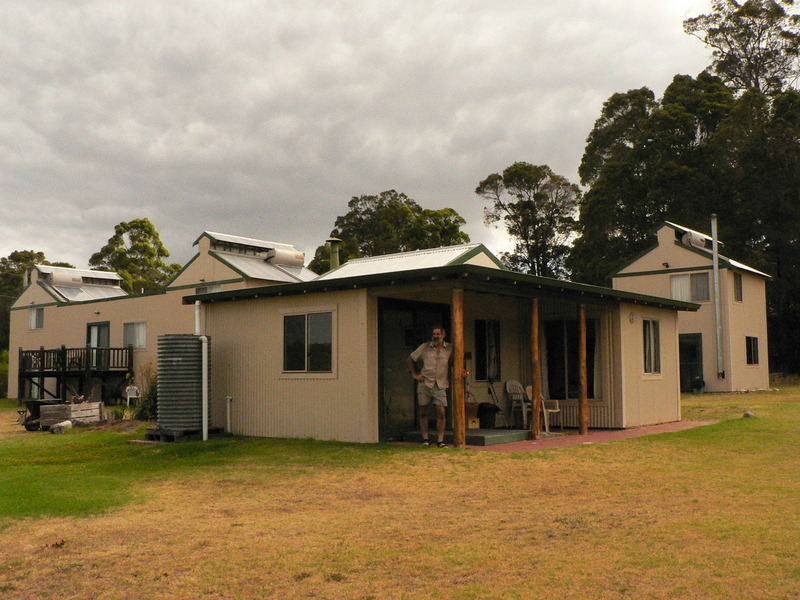 As we are closer to Perth and more people use the huts here, they have been placed closer together, so double hutting isn’t as hard as it would be down south. A wonderful climb on the granite up Mts Cooke, Cuthbert and Vincent, meeting 13 day walkers and 2 groups starting their end to end. 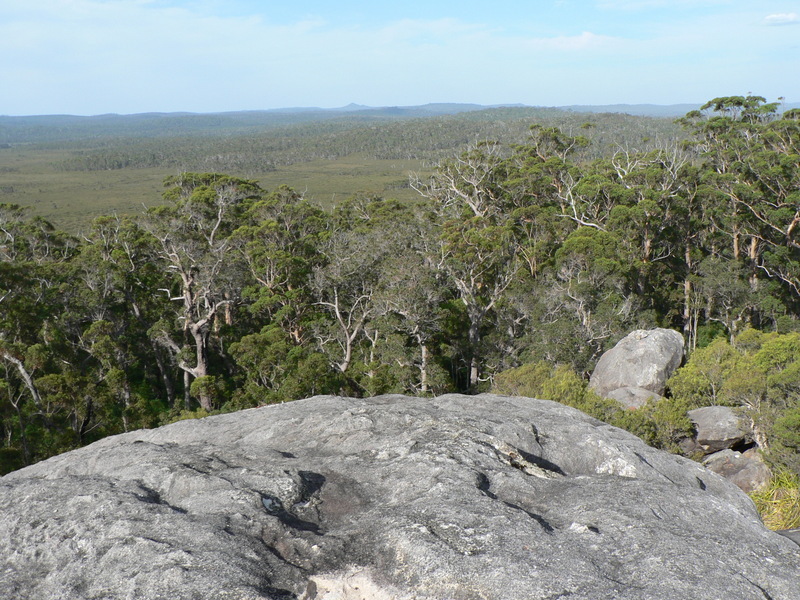 Great views from the tops, then an easy sidle around to the campsite. Two Iranian walkers give us some bananas and bread as they’re on their way out and someone else arrives to share the hut. Hiking season has started. A possum keeps us awake through the night trying to reach our food bags. 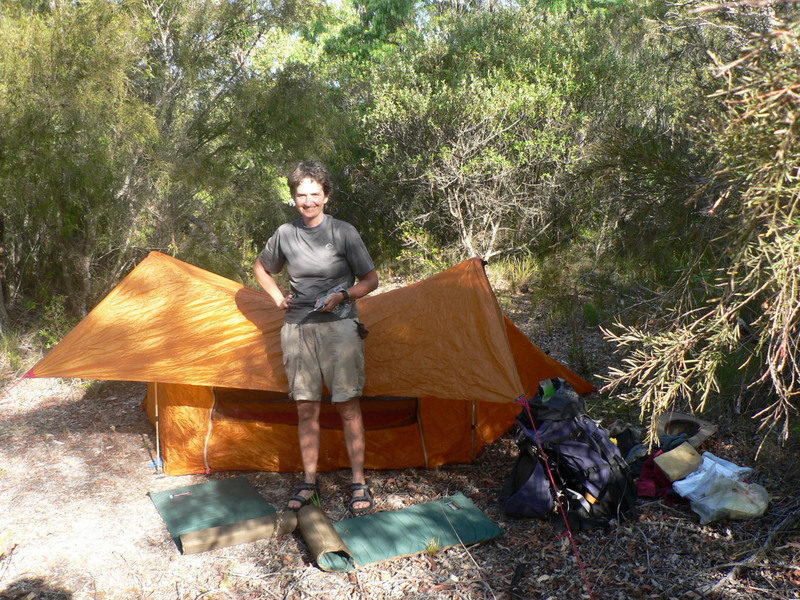 Sun 9th, Day 49 to Brookton Hut, 26.7 km. 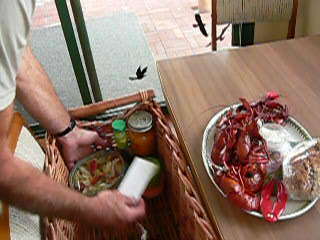 Another long and hard day in the heat, double hutting with lunch at Canning Hut, but we still arrive by 3 pm. Mon 10th, Day 50 to Waaleigh, 28.3 km. Mechanically walking by now, just to keep going. 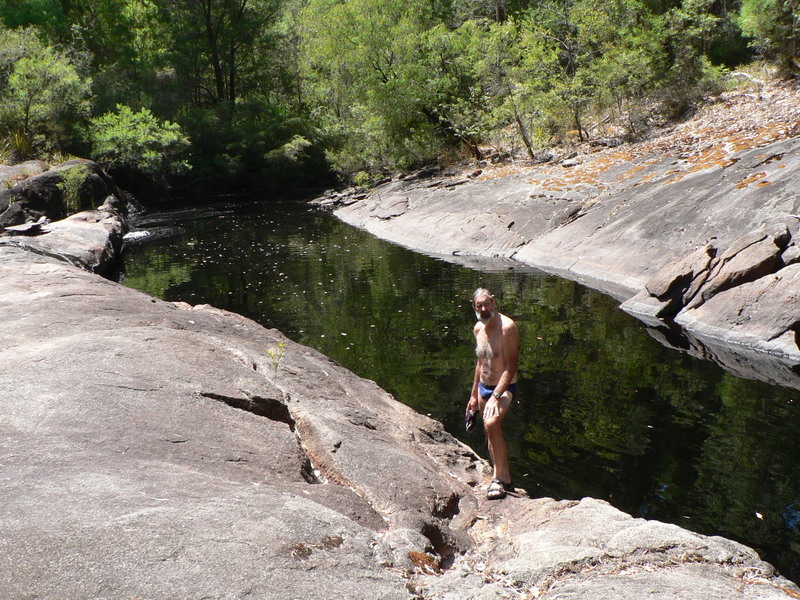 Found an orange tie-dyed sarong lost by Gail and reported in the Mt Dale logbook. We manage to mail it back to her later by driving back to the Mt Dale hut after the trip and copying down her address. 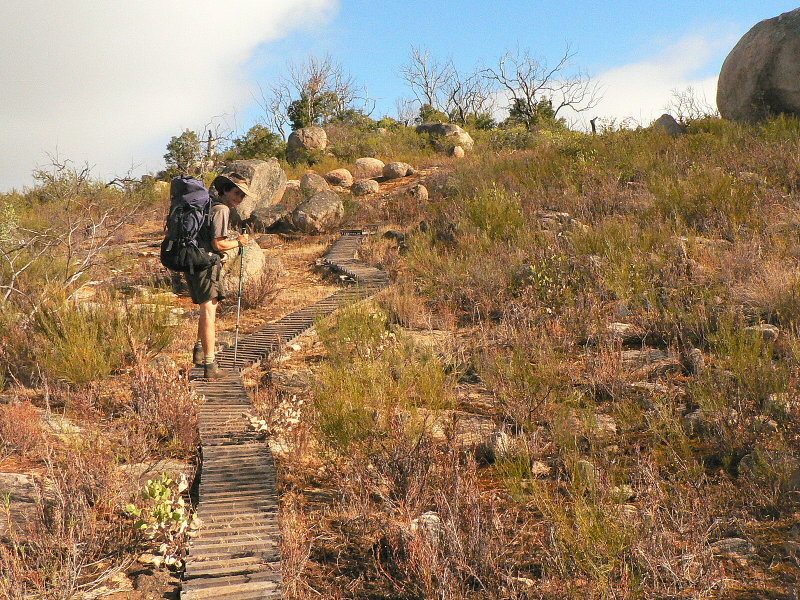 More hikers on the trail today, some end to ending. 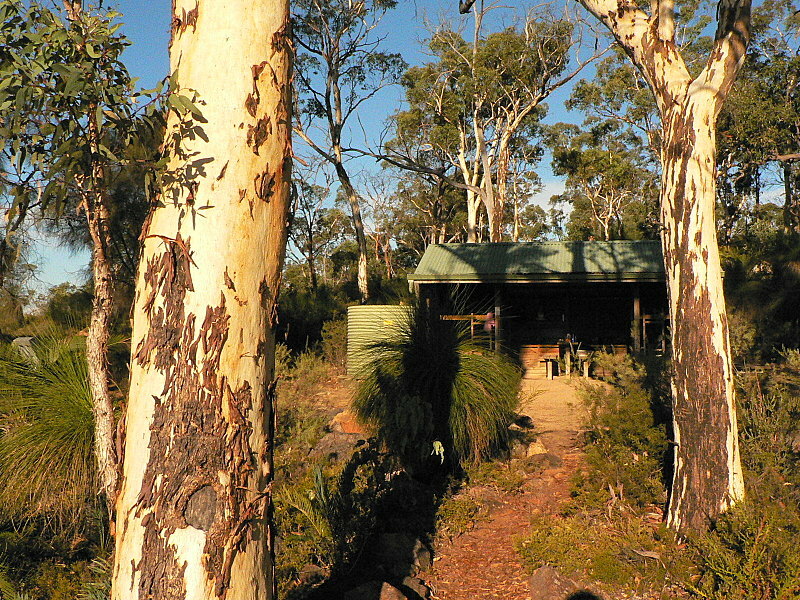 Waaleigh has a great vista, with the setting sun pouring into the hut and no shade to sit in. 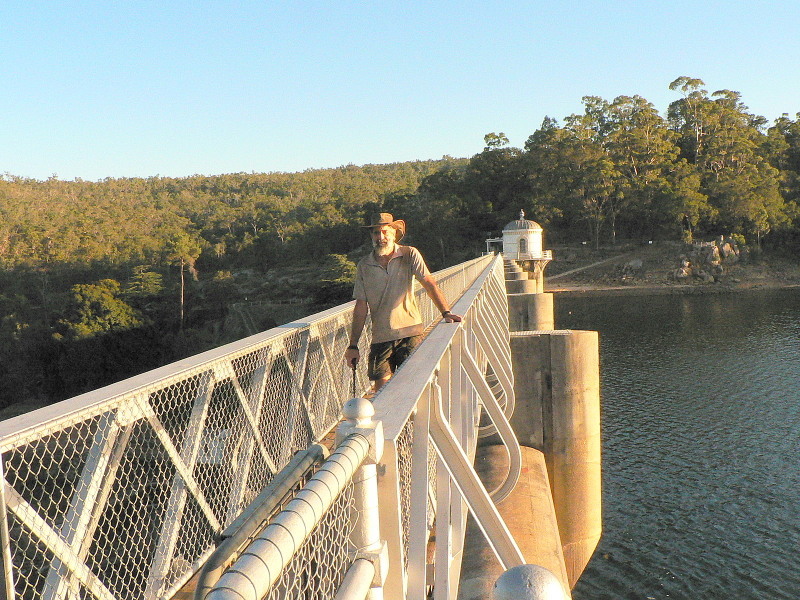 Tue 11th, Day 51 to Mundaring Weir YHA, 23.2 km. We arrived by lunchtime, so straight up to the pub and a sit down lunch then on up to the YHA. Hot inside, with the toilet and shower block outside. The warden had bought us steak, salad and potatoes for dinner, so we were able to watch tellie and charge the phone. 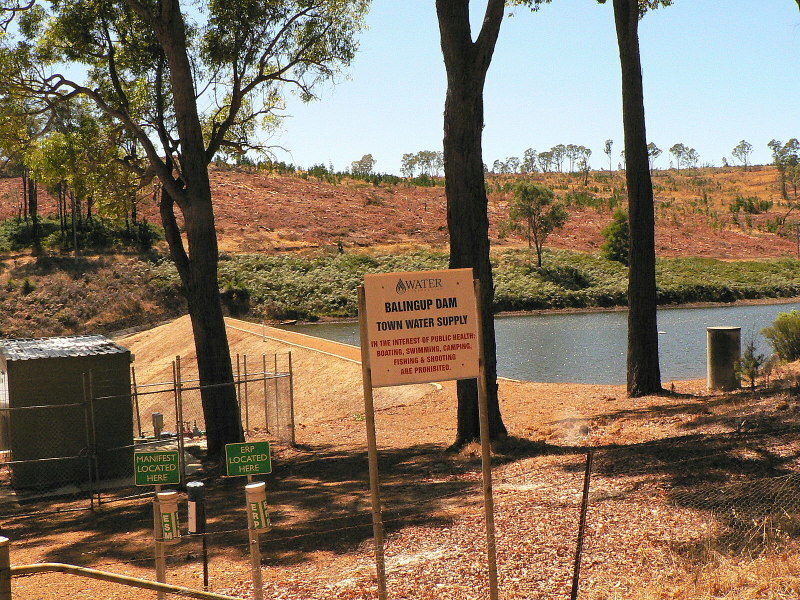 Wed 12th, Day 52 to Kalamunda, 15.7 km. 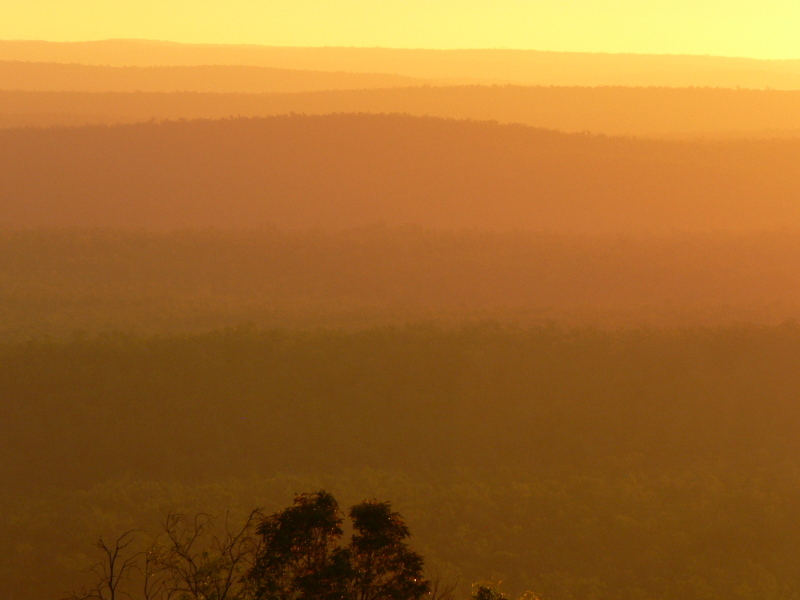 Another hot sweltering day and we managed to run out of water for the final climb up to Kalamunda. Took ages to help an old bystander to take our photo next to the end sign, as his dementia and Parkinsons were in control. Then across to the supermarket for rehydrating before the bus back to Fremantle and collapse with Taryn and Craig.